The day has finally come! Today I get to complete this journey of hiking every day for 365 days!!! To celebrate, my wonderful amazing friends have created a Meetup event to celebrate all that I have accomplished. 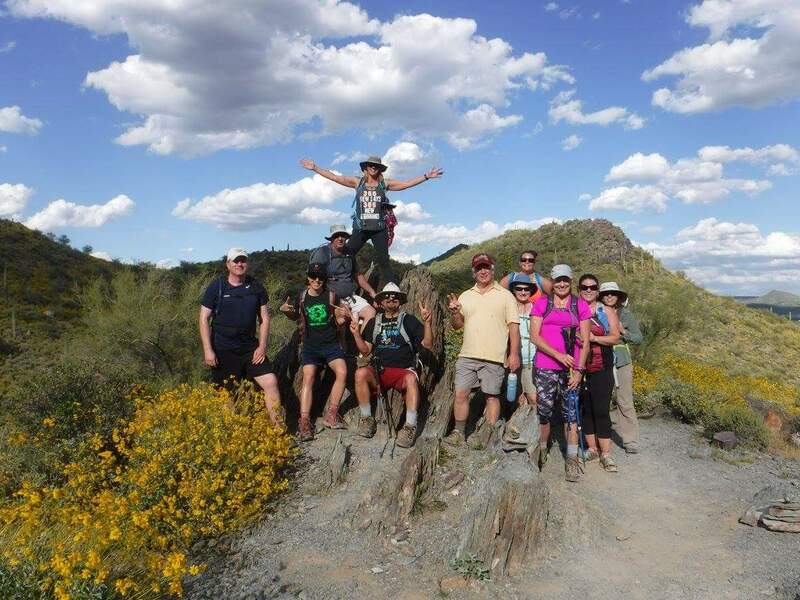 Trail Mix Hiking is a Meetup I joined a few years ago and they have been a huge part of my journey since that first hike I hiked with the group. I’m so grateful for all the friends I have met along the way. In the last 365-days, I have hiked 1100 miles, 22 mountains, 133 different trails, in 45 cities and in 7 states. Even with those stats, I wish I could have done so much more! Where has the time gone? Now that the end is here, it seems to have gone by so fast! 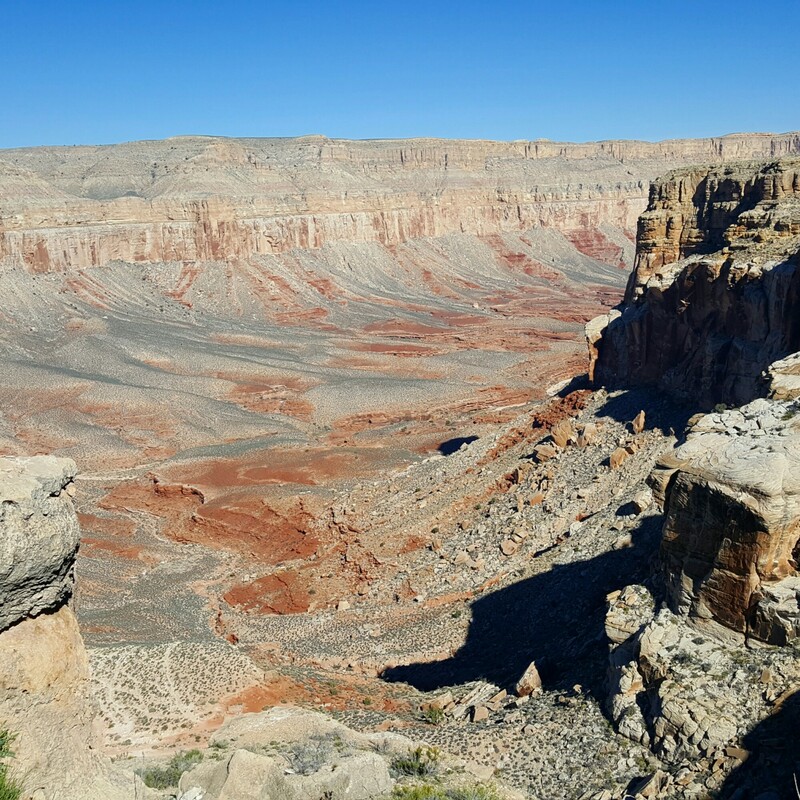 I have been to so many amazing places and experienced some awesome adventures, such as Rim to Rim in the Grand Canyon, Mt. Whitney and Cactus to Clouds, to name a few. Physically these were the hardest hikes for me on this journey. I’ve met some great friends along the way, along with meeting my new granddaughter and my amazing boyfriend! I’ve manage to hike through this journey while losing my best friend Robin, my grandmother Elizabeth and my own mother Rebecca. Some of though toughest hikes were on those days. Dealing with loss is difficult, but using my hiking as healing, I have continued this journey and begun to heal. 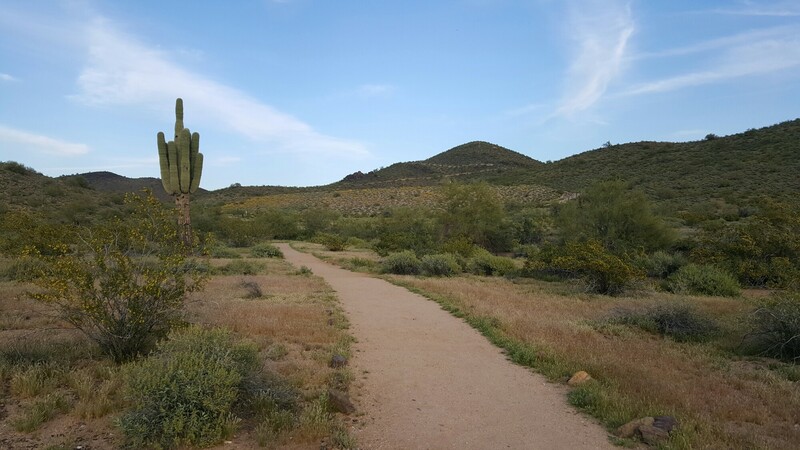 For day 365 I chose to hike the Go John Trail in the Cave Creek Regional Park. 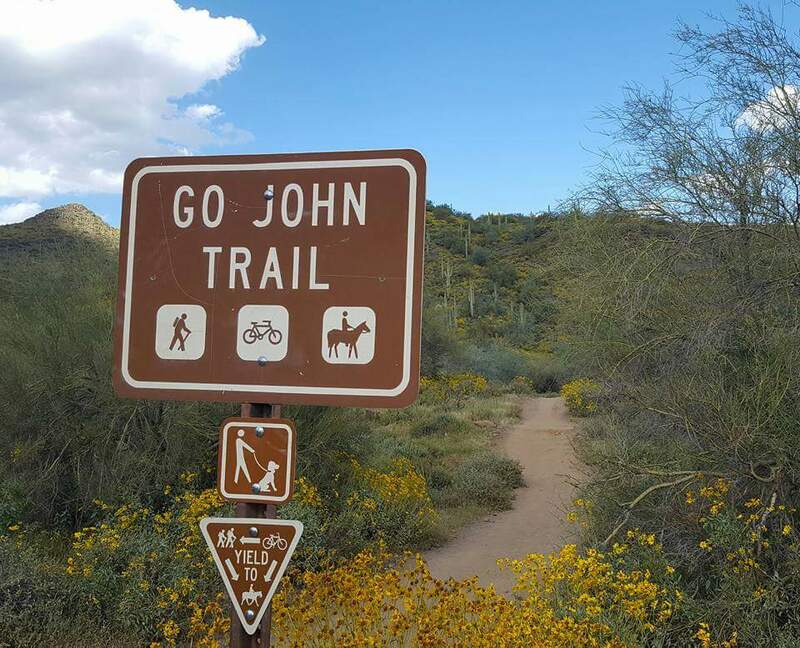 Go John is the first trail I hiked almost four years ago, training for an adventure to come later that same year in Havasupai. This is the trail that truly began my love of hiking. Hiking this trail today means so much to me. Ending my 365-day journey where it all began and coming full circle on this adventure, has such meaning and purpose. The day couldn’t have been any better! Our hike began heading east on the Go John Trail. We started at 3 p.m. and it was beautiful outside. Not too warm out, which is something I was afraid of, and we were blessed with a slight breeze for most of our adventure. From the first moment we set foot on this trail, the views were amazing. 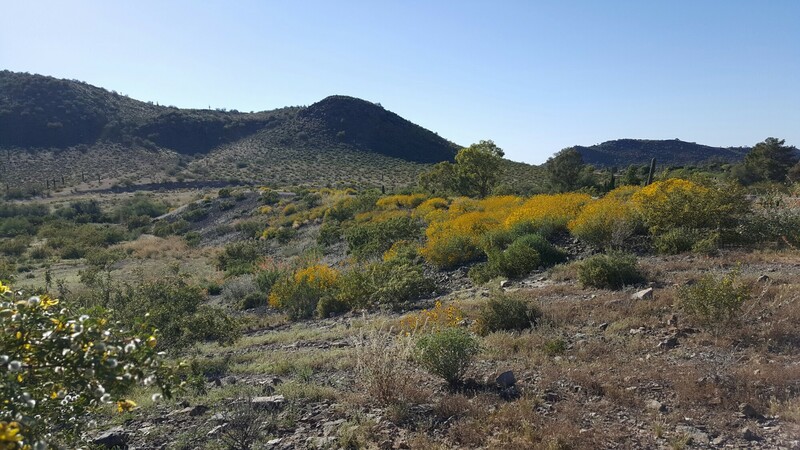 The wild flowers in this park covered the landscape and were in full bloom! The skies were a bright blue and the clouds fluffy and white. It’s a beautiful day for a hike! 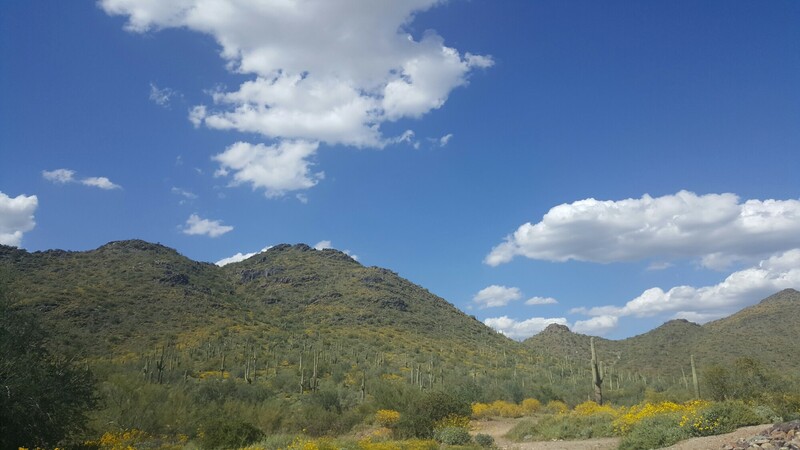 As we began heading north, we were greeted with brighter blue skies, white fluffy clouds and a valley of green. 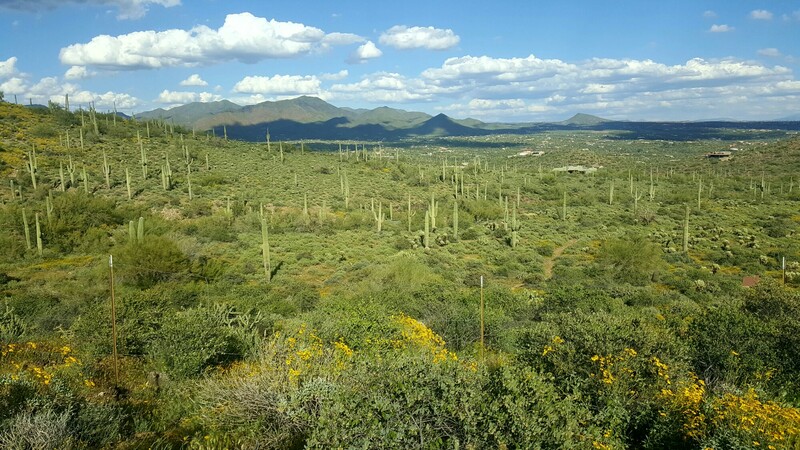 The cacti are in abundance to help make for the stunning views we were blessed to see. 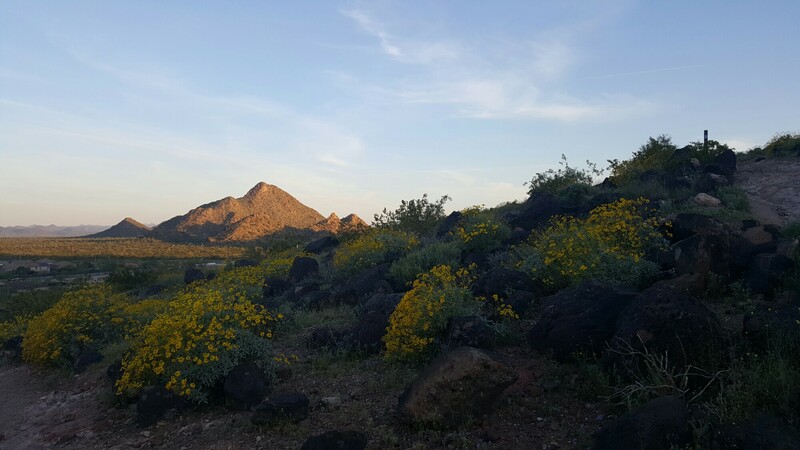 Noticing that on the north side of the mountain, there weren’t as many wild flowers, possibly because they have yet to bloom. I may have to come back here to see the beauty it has to offer in a couple weeks. I don’t think I could ever get enough of this place. 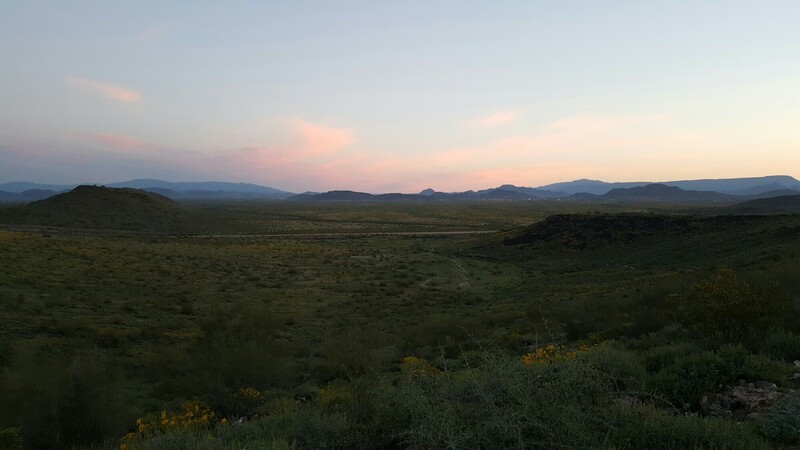 The views of the desert, if you could call it that (currently is doesn’t look like a desert), are so spectacular. 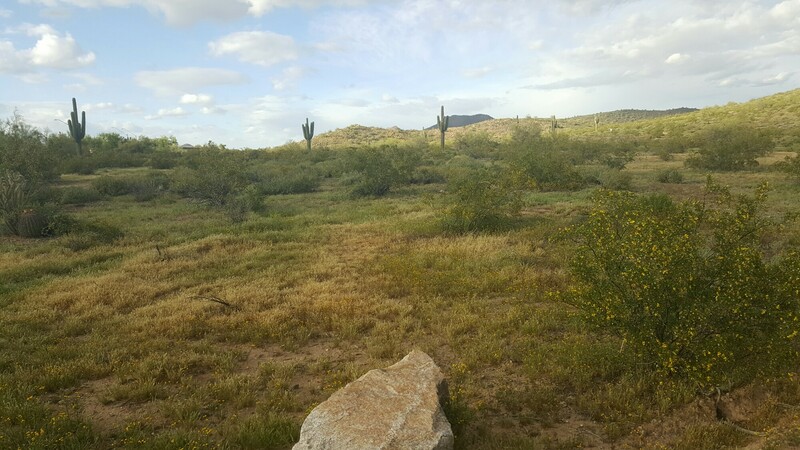 If you have never been to one of the Maricopa Regional Parks, you need to go. I believe there are ten parks and they are all amazing, each with their own features. As we hiked the trail, we were visited by many small white butterflies. My twelve-year-old daughter often tells me that when she sees a butterfly it means her daddy visiting from heaven. Her daddy, Jimmy, passed away only a year-and-a-half ago, and whenever I see a butterfly, I think of him. I have seen many butterflies as I hiked along my journey, wondering if he’s accompanied me along the way, but today, there were more butterflies than I have ever seen on the trails. I found the meaning of a white butterfly online stating that… “butterflies generally represent souls, and white is the color for purity. In general terms, it’s simply a pure soul. If it visits you at an important moment in your life, it may represent a guardian spirit, ushering you along the path of life”. How beautiful could that meaning be on a day like today? With the loss of so many loved ones that I’ve come to endure in the last year-and-a-half. I can’t help but think of the importance of this day, and how just maybe, my loved ones are here to join me on my final day of this journey. We stopped after a few miles of hiking to take our group picture. With Trail Mix, we always do a group picture, it’s like a tradition. An amazing group of friends, new and old. I am truly blessed to have some amazing friends in this life who share the same passion as I do. Honestly, all the hikers I have ever met are truly amazing souls. Hiking along the Go John Trail, after about four-and-a-half-miles we made our way to the Overton Trail. I happened to have hiked the Overton Trail on day 36 with Trail Mix, when this journey was in the beginning stages. 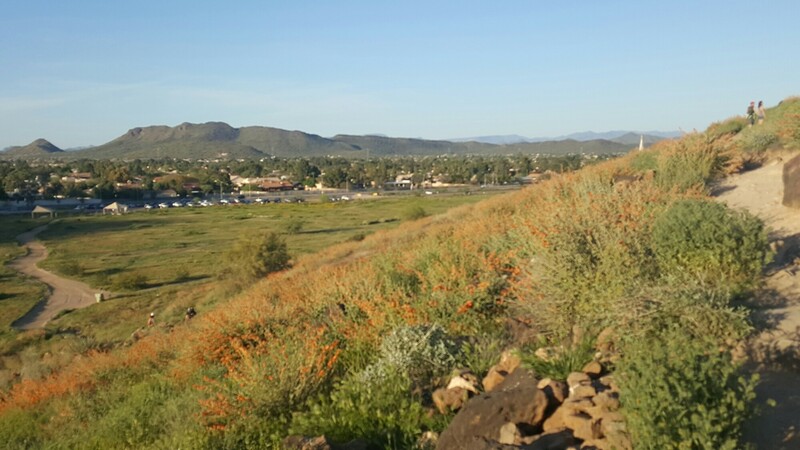 The Overton Trail offers more stunning views of the Cave Creek Regional Park. The last couple miles of our hike were on the Overton Trail. My journey would be coming to an end with this hike, and I was happy and sad in the same moment. I was happy to have completed my goal. I set out to do something and I completed it. No matter what the circumstance I had to endure, I was determined to accomplish my goal. I was feeling sad because my journey was ending. For the last year, this has been my life. Hiking daily has been my focus and it has become a part of me and who I am. Tomorrow, that all stops. Tomorrow I am choosing not to go hiking. That seems like such an odd thought now. 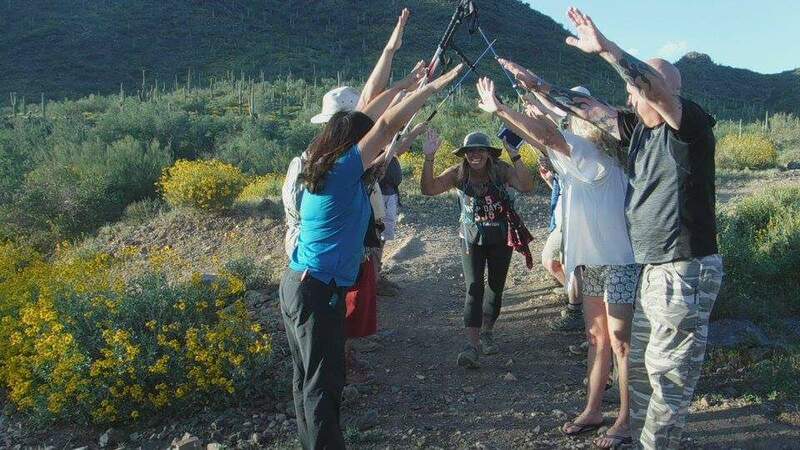 I was asked to wait a moment on the trail while everyone set up a tunnel to greet me for my final steps of my 1100 mile journey in 365 days! What an amazing feeling to have my friends here to support me. I truly am blessed! And now, my journey is over. I have hiked every day for 365 days! After the hike, I was lucky enough to have a few more friends make it to the party. We had a wonderful potluck. Which after a six-and-a-half-mile hike, it’s always great to eat. I had made a slideshow of 400 of my favorite photos from this journey, and everyone sat down to watch my journey. The bonfire had been started and Sabrina had brought marshmallows. 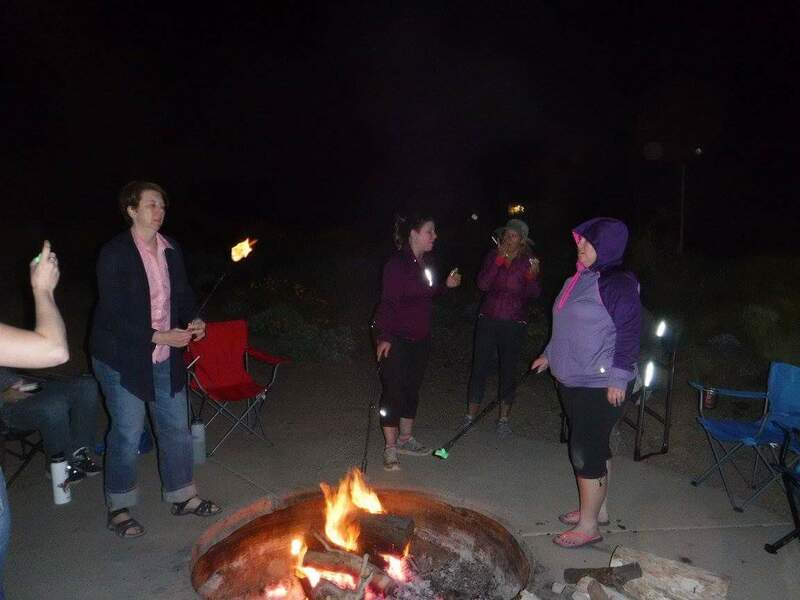 With roasted Marsha-mallows, we enjoyed s’mores as we sat around the fire pit trying to avoid the smoke. This day couldn’t have turned out more perfect! I was able to complete my 365th hike with some of the most amazing friends. I look forward to more adventures and who knows, maybe I’ll get the opportunity to hike 365 days once again. Join me on my journey of hiking every day for 365 days, to see all that I can see! Never miss out on a post and “like” me on Facebook , check out my videos on YouTube, and for more photos follow me on Flick and Instagram! With only one day to go on this journey, I had great intentions of doing some awesome hiking today. 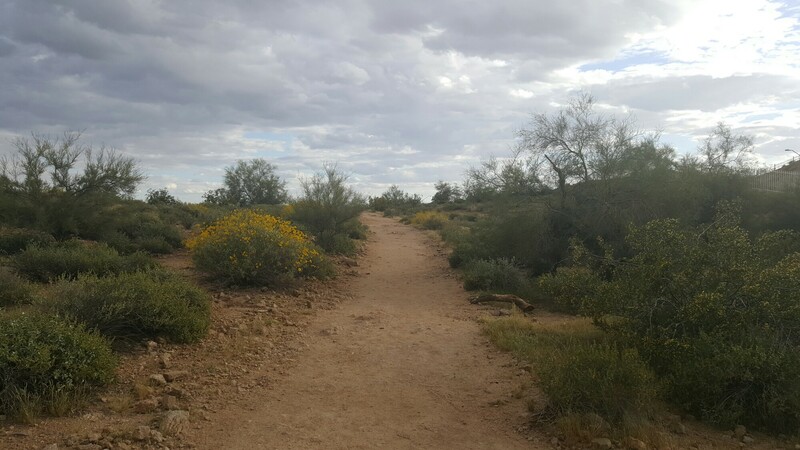 I had worked at our Paradise Valley office today, and I planned to do any trail I have never done before. Thinking I would end this year on an amazing exploratory adventure. However, that didn’t happen, I was exhausted after work and didn’t really want to work for my hike today. 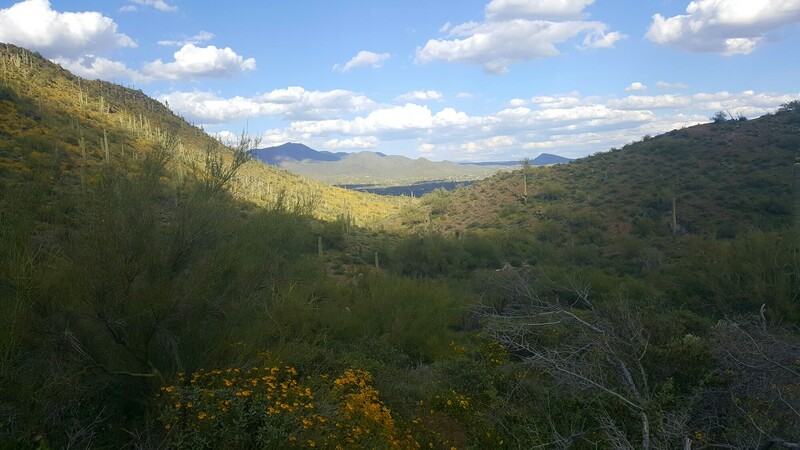 So I decided to hike around the valley of the North Mountain Preserve instead on the easy flat trails that wouldn’t cause me too much exhaustion. Starting out on Trail #100 from the North Mountain Visitor Center, I began my hike. I happened to be wearing all black and at 5 pm, the sun was still shining brightly. It was a much warmer hike than I had anticipated. With my clothes heating up my core, I felt ever more exhausted. At the first junction I made a right, my intent for this hike was to now get over with as soon as possible. As I made my way around the circle, I noticed the flowers were still in bloom. 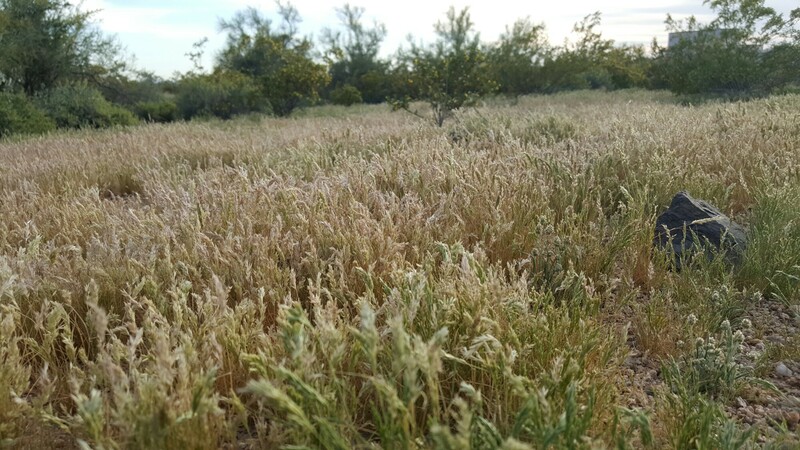 I love springtime in the desert. 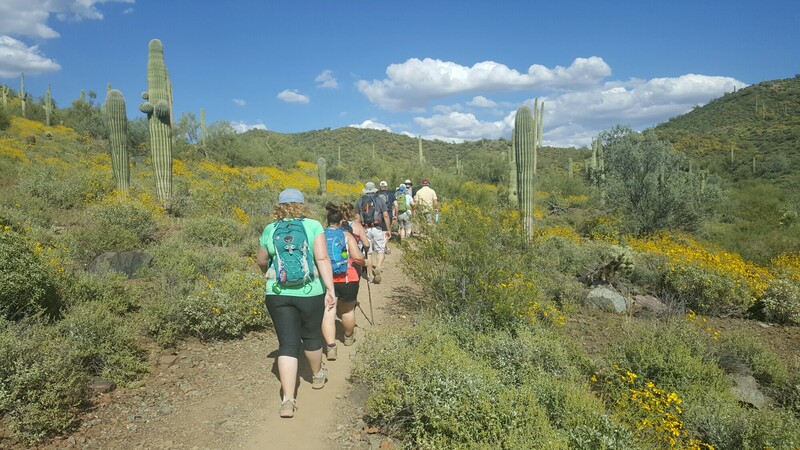 All you need to do is get to a trail and you are in a desert wildflower botanical garden. It truly is a beautiful sight! I followed the circle around which took me along Trail 306 leading me towards the trailhead. 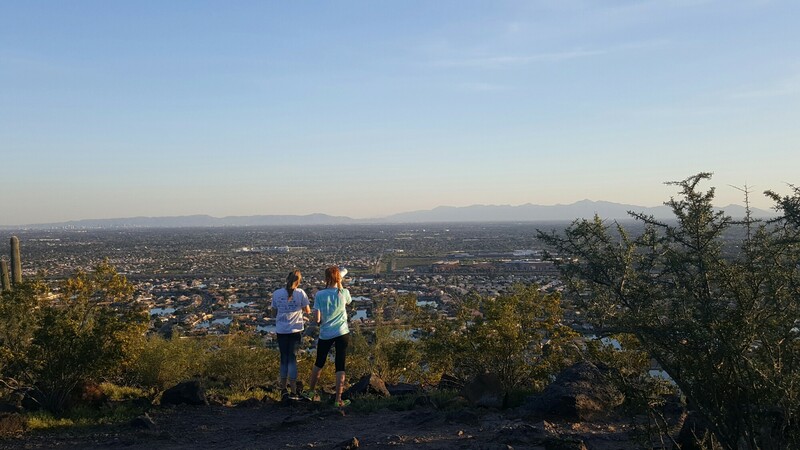 Capturing a view of North Mountain standing tall in the distance. I made it back to the visitor center with just over a mile and a half hike. Enough for me to continue on this journey of hiking everyday for a year. Only one day to go on this amazing journey!!! 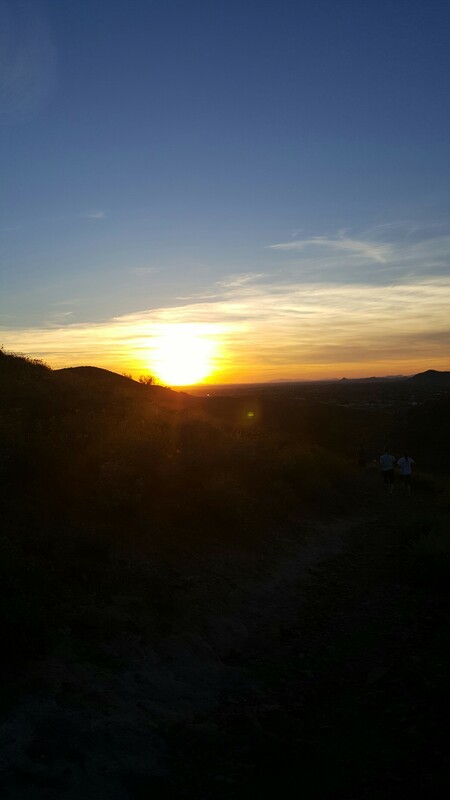 A beautiful evening for a hike! 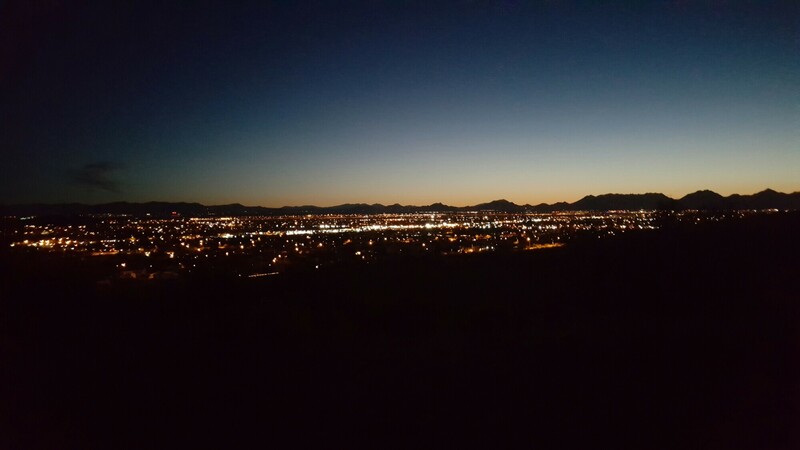 Parking at Thunderbird Mountain off 67th Avenue, I decided to get a quick hike in tonight. Life is getting so busy, I have been having to try and make time for hiking. With only two days left, I think I can manage. It had been raining off and on all day today and with a break in the rain, I decided to hit the trails immediately after work. It didn’t look like it was going to rain anymore today, but it also didn’t look like rain earlier in the day either. 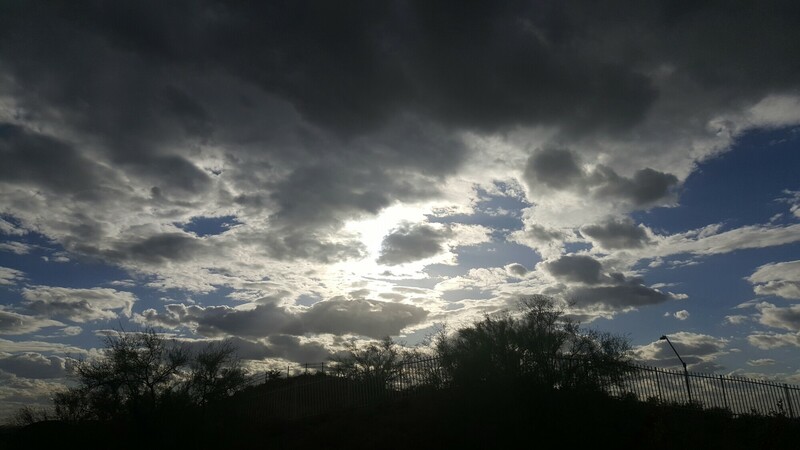 The sun was peaking through the clouds, a beautiful image, as I headed south through the flat trails on the west side of the park. The trail I chose is a loop. 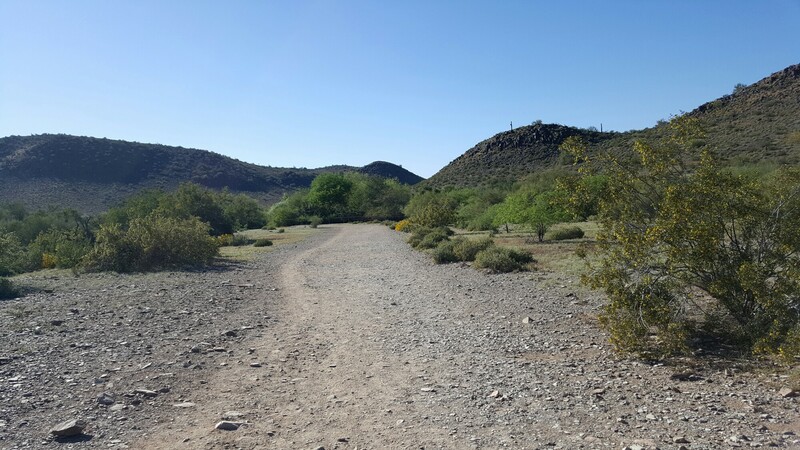 Part of the trail is the Coachwhip Trail and the other part is an unnamed trail, which I believe is only a dirt road that is on the outskirts of the park, used by the city to manage the trails. It’s enough for me to get a mile hike in today, so I will use whatever trail is available. Even though the grass is beginning to die and turn brown, there is still green all around me. I’m so grateful to live so close to such a beautiful place. 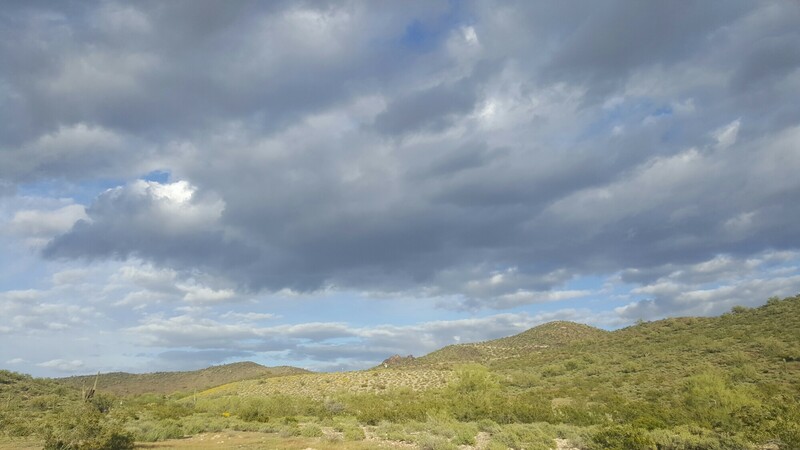 As I made my way around the trail, heading back to the trailhead, a dark cloud was hanging over the mountain, maybe it will rain again. I won’t be out here on the trail long enough to find out. I have been lucky enough to only encounter a little bit of sprinkles on this journey. I could probably count on one hand how many times I’ve hiked in the rain. 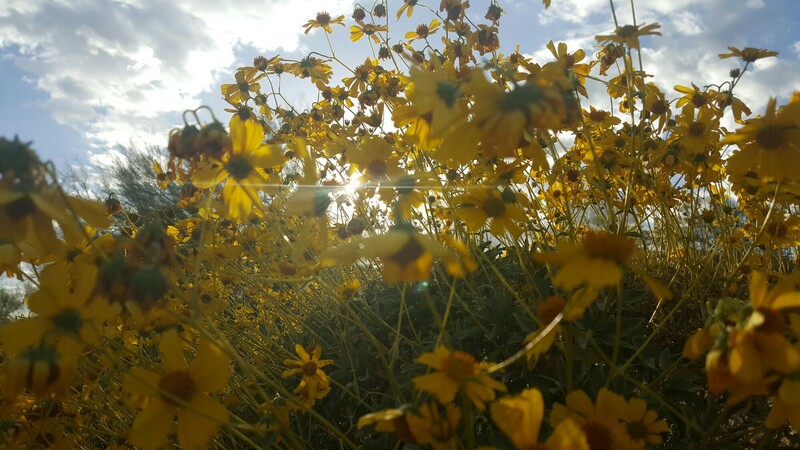 Just over the hill, I caught glimpse of a ray of sunshine peaking through the wildflowers. A perfect depiction of this beautiful spring day. I hiked my mile and headed off to do the busy things in life. Another beautiful day on the trails. Although, I am getting a little sad that this journey is almost over. Not that I will never hike again, more journey’s are awaiting, but that I have almost completed what I set out to do. This has been my life for a year, and I have no idea what to do next! Join me on my journey of hiking everyday for 365 days, to see all that I can see! Never miss out on a post and “like” me on Facebook ,check out my videos on YouTube, and for more photos follow me on Flick and Instagram! 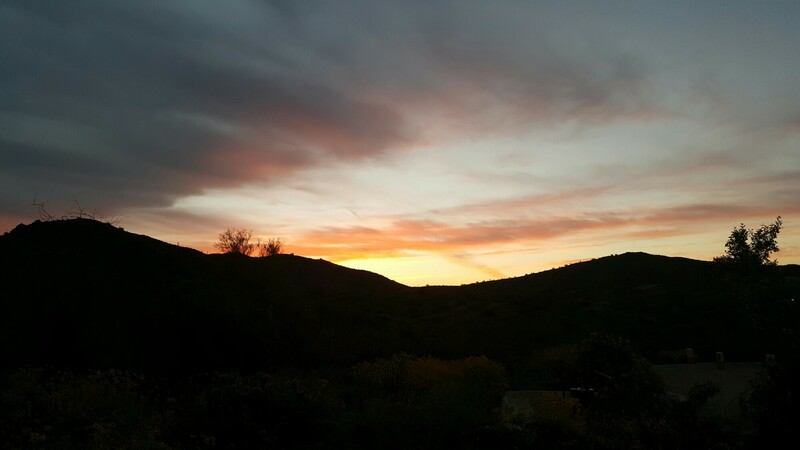 Arriving at the Desert Vista Trailhead at sunrise, I caught sight of the beautiful colors of the sunrise coming over the mountain. They only became more vibrant as I climbed up the Hawks Nest Trail. 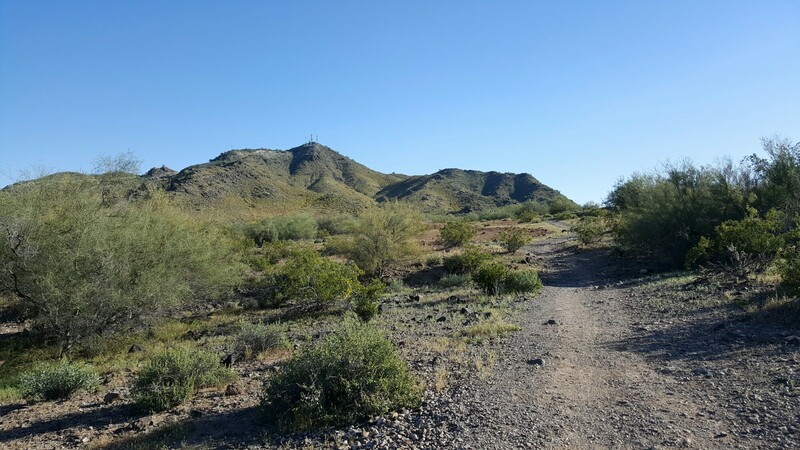 My plan today, was to do a loop heading up the Hawks Nest Trail to Dixie Mountain Loop, then down the Valle Vista Trail, and finally head back on the Desert Tortoise Trail. Giving me approximately a three mile hike. As I hiked up the Hawks Nest Trail, I realized my body was sore. The Hawks Nest Trail is a tough little climb with about a 350 foot elevation gain in less than a half mile. 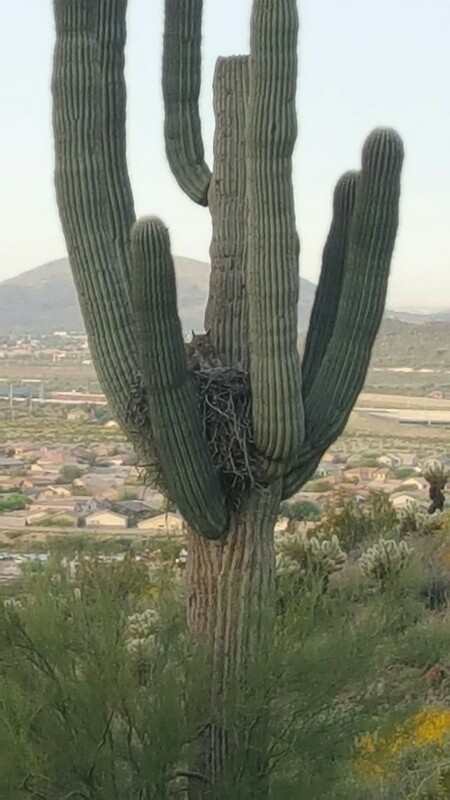 My whole reason for coming here today was to see the momma owl and her owlets in the huge saguaro cactus that sits just off the trail. Every year, around this time, a momma owl comes to have her babies. I was blessed only to see the momma, but no owlets in sight. 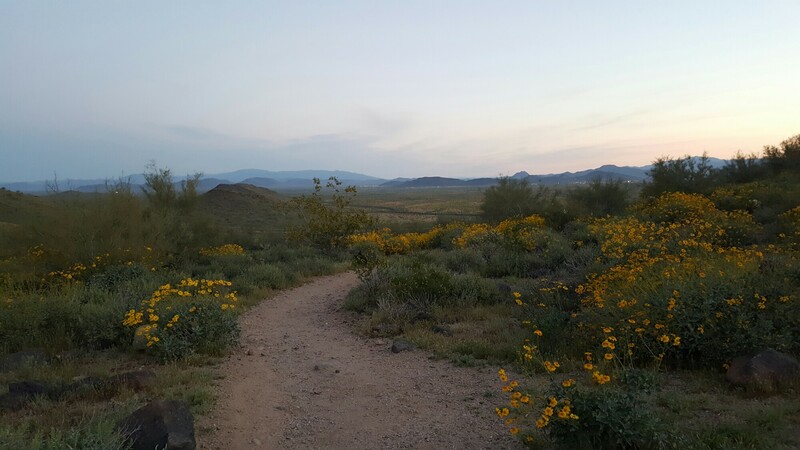 The flowers were in bloom as I made my way to the top of the trail. 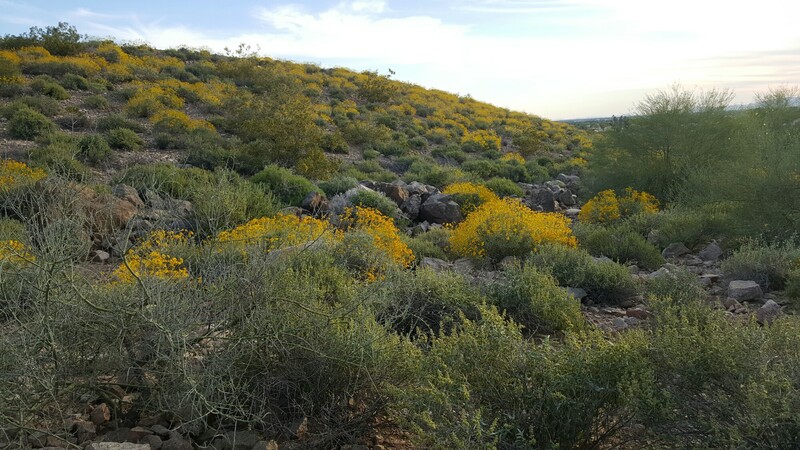 The smell of the flowers permeated the air, a fresh fragrant smell in the desert. I continued on to the saddle, where I would make a right turn on the Dixie Mountain Loop Trail. 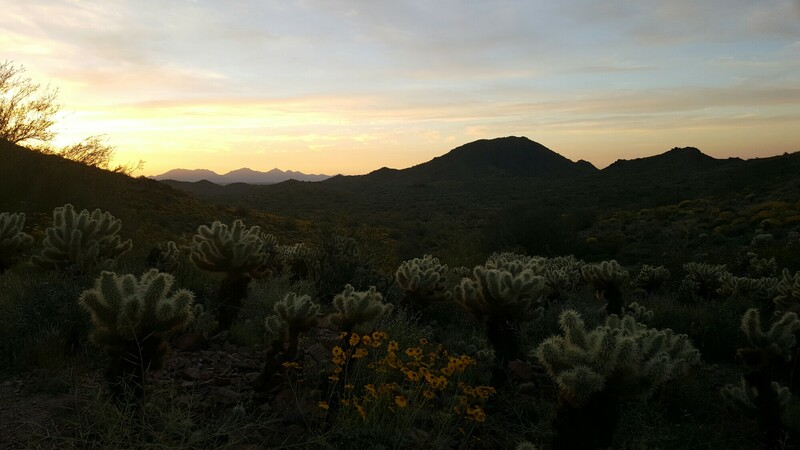 With the sun continuing to rise, it cast shadows on the cholla cacti, giving the white needles a soft fuzzy look. 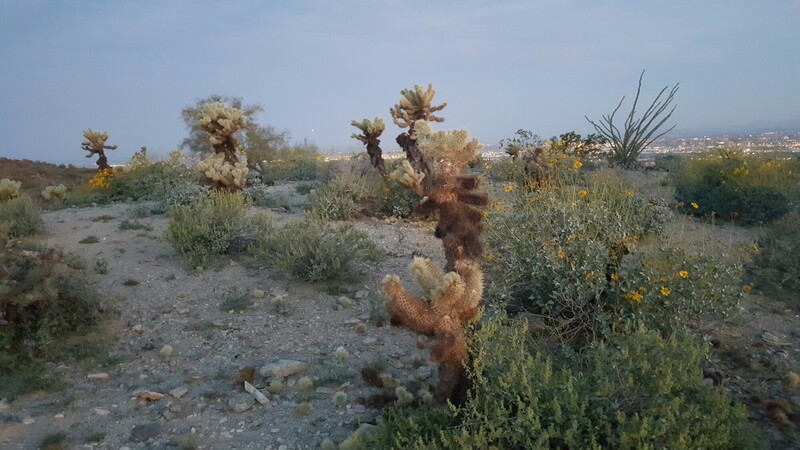 But don’t let the look fool you, these cholla are what we call, jumping cholla. If you brush up against one, the spines easily attach to your clothing, your skin or your shoes. 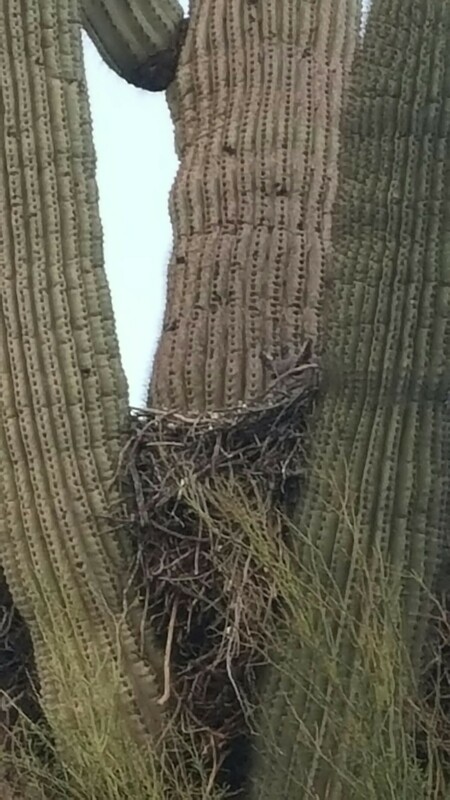 Since the plant is covered with spines, they are difficult to remove. I see them all the time on the trail and if you get too close, they’re like a magnet. They roll their way to you and cling to your body. 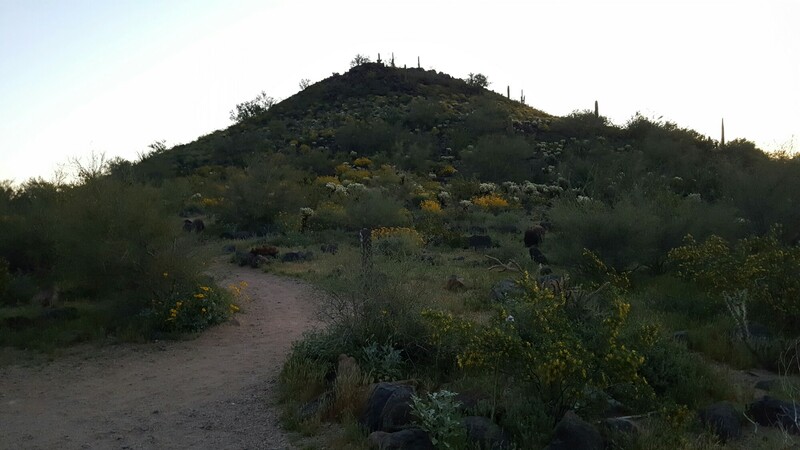 The early morning sun shining on the mountain always makes the desert come alive with it’s rich colors. 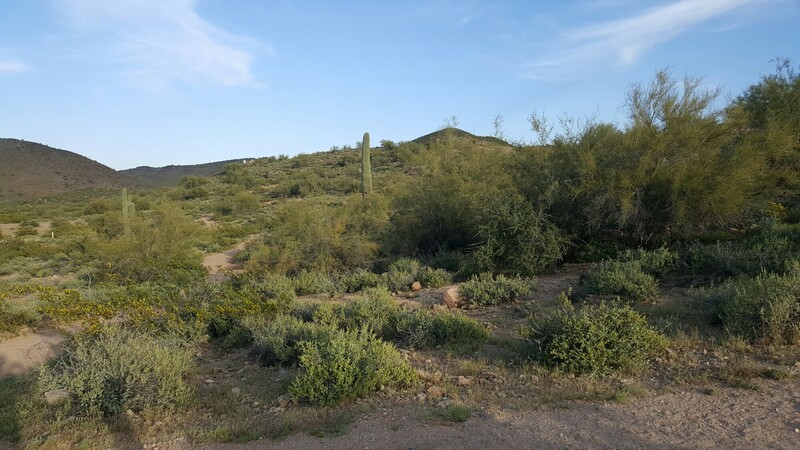 I came to the Valle Verde Trail turn off and decided, I wasn’t going to do the loop I had planned. Instead I stayed on the Dixie Mountain Loop until my tracker read one mile before turning around to head back the way I had come. I decided I wanted to see if the owlets were awake on my way back down the trail. The baby owls are what I really wanted to see on this hike today and my whole reason for coming to this trail. 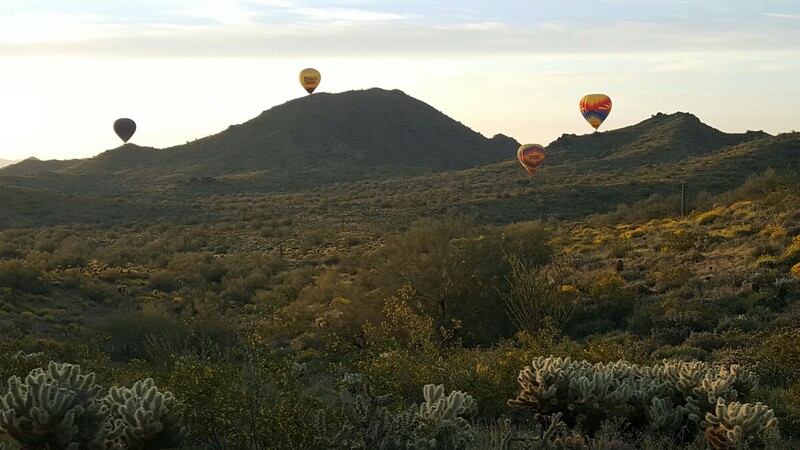 As I headed back to the trailhead on the Dixie Mountain Loop, I was surprised to see the hot air balloons. The balloons were heading towards me and I had hoped they would come close enough I could capture a great picture. As the balloons continued to get closer, I was heading in the direction away from them. However, I did realize the balloons were directly over the trail I had initially intended to hike. Darn my luck! The balloons are really one of my favorite things to see on the trails. Especially on these trails. 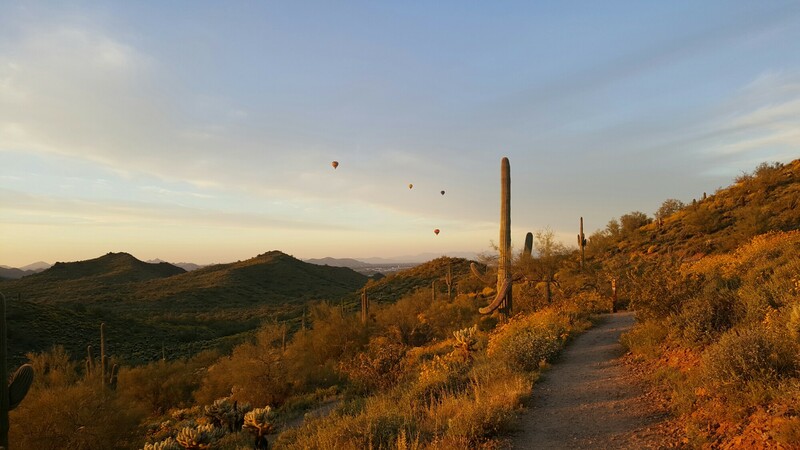 The Desert Vista Trailhead is far north of the city and the balloons fly overhead all the time. They were close enough today, that I could actually heard the roar from the heat that keeps the balloon in the air. Heading back down the Hawks Nest Trail, only momma was was visible in the nest. I was sadly disappointed, but at least I tried and I still had a beautiful hike. Also, I did get to see an owl, so who am I to complain about that? 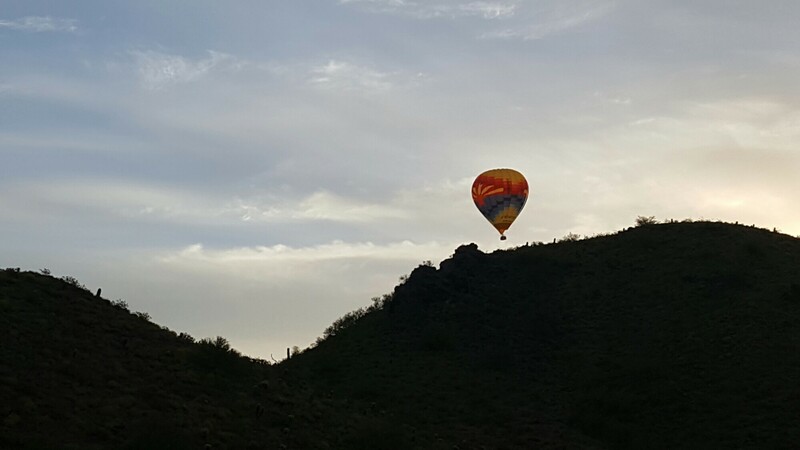 As I made my way downhill to the trailhead, hearing the roar of the fire, I turned around and to my surprise, I saw a hot air balloon just behind me. A little bonus to the end of my hike. 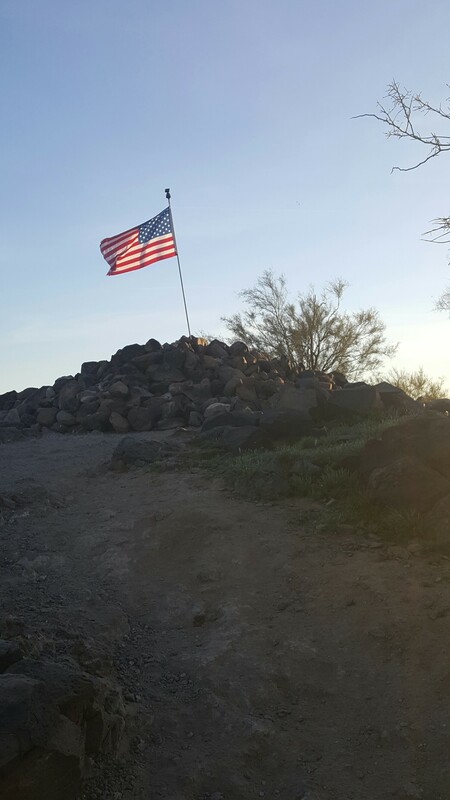 What a beautiful day for an early morning hike! The balloons, an owl and the sunrise, I couldn’t ask for a more amazing day in this life and on this journey!!! 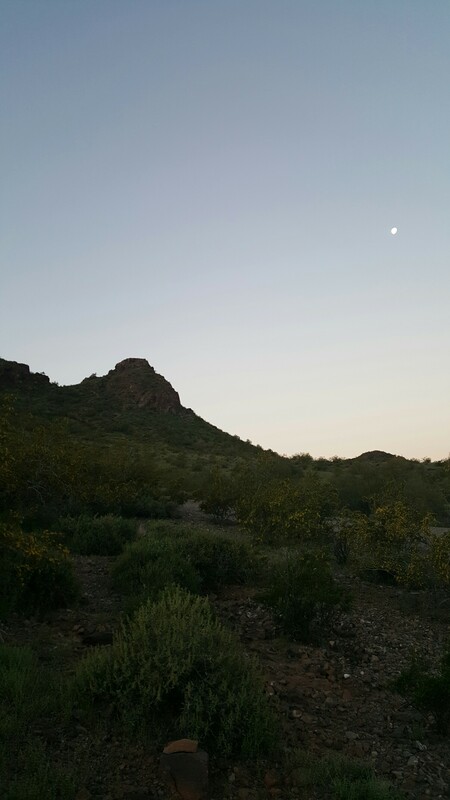 It was a beautiful evening for a hike. Tonight would be a quick one, I just have too much to do today. Parking at 67th Avenue, my whole goal was to get at least a mile in today. 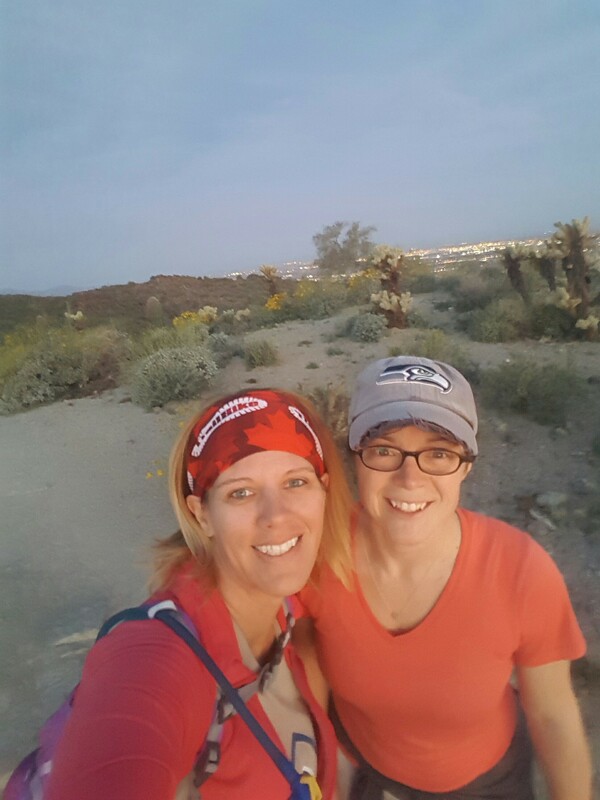 Debating between doing the flat trail or doing some elevation, I decided I would begin with the old route my friend Lori and I used to always do. This route would get me uphill a little bit and since it was going to be a short hike, I thought I would make it just a little bit harder. I immediately headed uphill on the Desert Iguana Trail, which lasts for about half a second or a tenth of a mile. Coming to the first intersection I made a right and was now on the Chuckwalla Trail. Still climbing uphill a little higher. Hiking along the Chuckwalla Trail ridgeline, if you could call it that, I looked back to see the sun still high in the sky. I guess there will be no more early sunsets, the days are getting longer as summer comes upon us. The temperature was 91 degrees out tonight, it didn’t feel hot, but the heat is on its way. 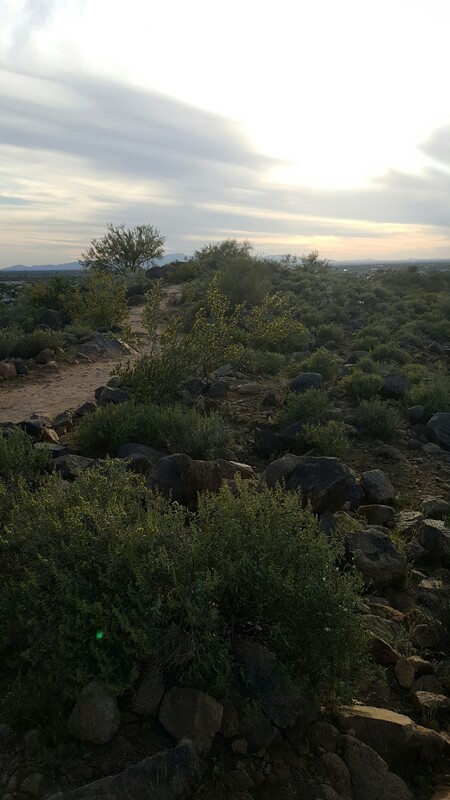 Once at the base of the Chuckwalla Trail, I decided instead of continuing on uphill, because this would be a quick hike, I would turn on the Sunrise Trail to head back to the trailhead. The flowers still scattered all about on the hillside. Taking it all in where I can because they won’t last long with the heat coming. I have never seen so many flowers. As I continued along the trail, I realized the grass is no longer green. We’re beginning to become the brown dried desert we once were. Soon that is all we will be. Still beautiful, but brown rather than green. 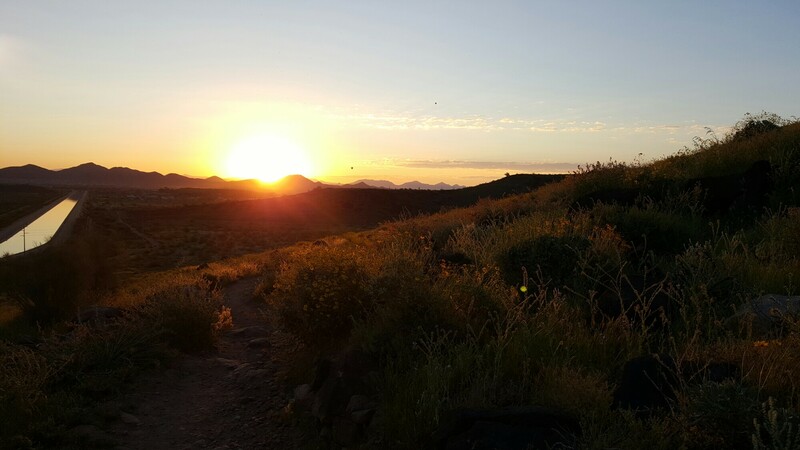 One last photo on the Sunrise Trail before I turned on the Coach Whip Trail that would bring me back to the parking lot. My hike ended up being less than a mile. 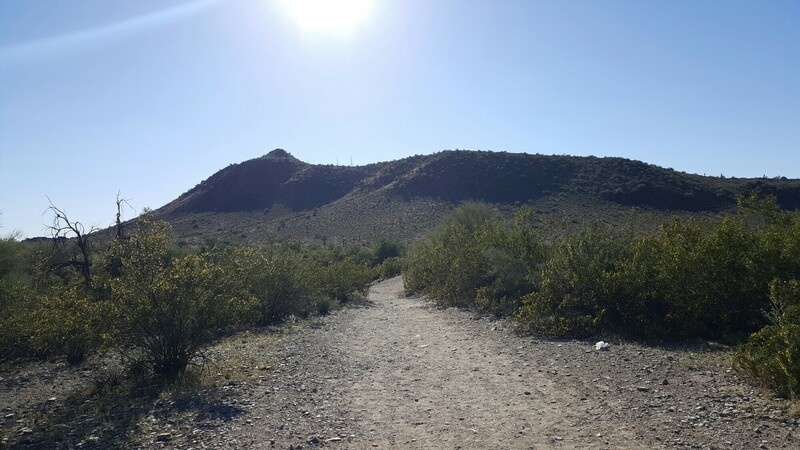 I didn’t meet my goal, but still, I made it to the trails and went for a hike. Another day in this amazing life hiking everyday for 365 days! An early morning sunrise hike at Deems Hill, Eric and I decided to head east on the Circumference Trail today going up the hill, avoiding the shirtless man wandering the parking lot. No idea what he was doing, but we figured we’d be safer if we didn’t find out. It was dark out, but light enough when we began our hike, we didn’t need our headlamps. 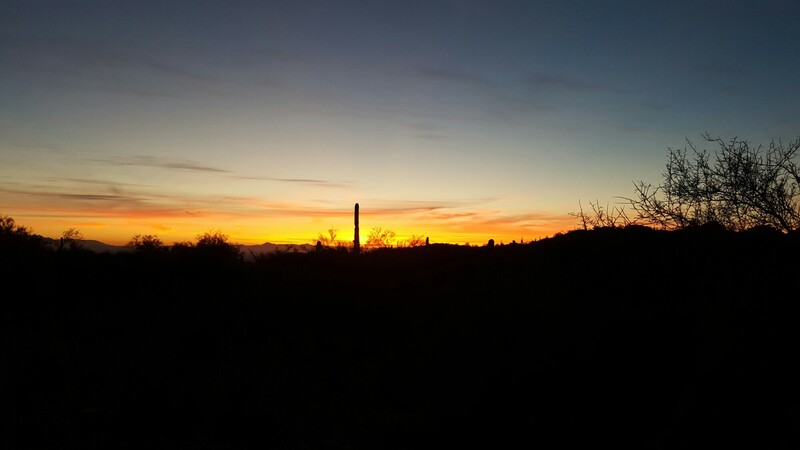 The colors of the sunrise were beginning to show their beauty as we made our way up the trail. Climbing up to the saddle felt easier this time than the last time I had done this. 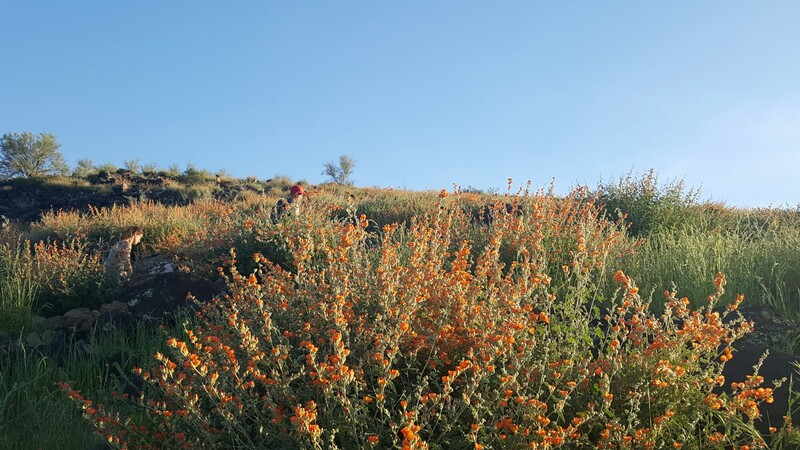 The flowers were in bloom on the saddle of Deem Hills as well. 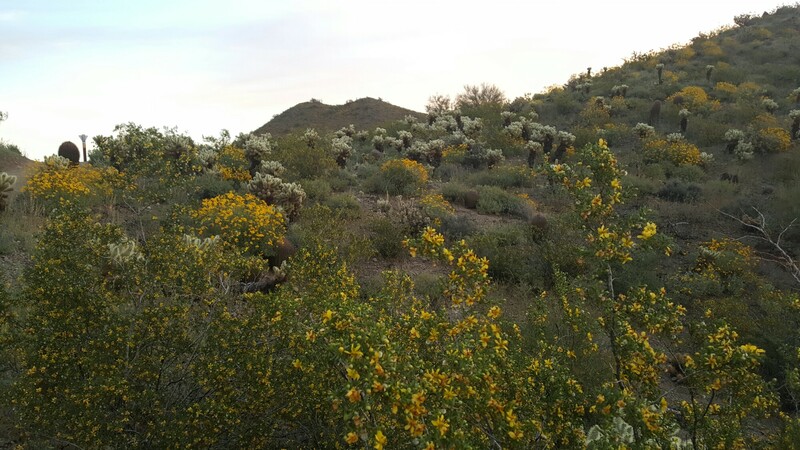 The yellow flowers, mixed in with the white of the cholla cacti and the beautiful green, made for a stark contrast of colors. Coming down the other side of the saddle we found even more flowers. 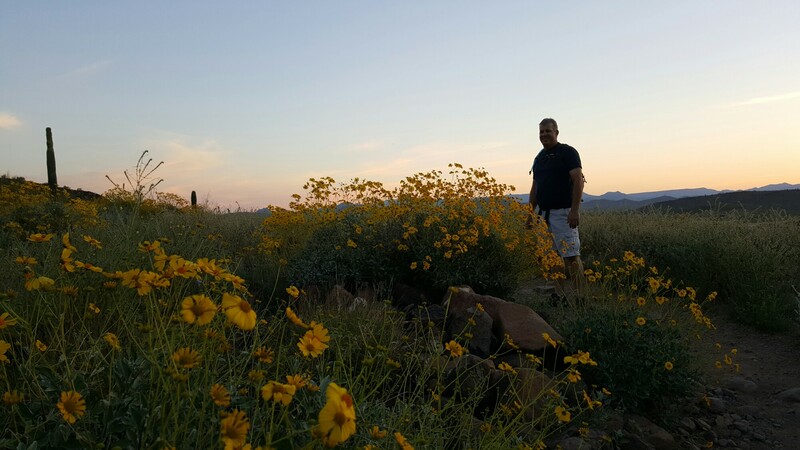 Spring has sprung here in the desert and it’s such a beautiful place to be! Making our way around the east side of the mountain, the sun was beginning to brighten up the sky with a soft shade of pink. The valley between the two hills at Deems still fully green. There weren’t as many flower in the valley, none really. Still it is gorgeous to me. As we began to turn and head west around the hill, the sun began peaking out over the horizon. Casting it rays on the mountainside make the desert come alive with it’s beauty. If I could, I would be out here all the time! Welcome to the first day of spring! The flower here in the desert are in their full grandeur. I can’t believe how overgrown the plants, flowers, or possibly weeds, have become. Standing almost to Eric’s shoulders, I had to snap a picture of the height they have become. Heading back to the trailhead there were even more flowers to see on the west side of the mountain. The length of the entire Circumference Trail is 5.73 miles, but at the saddle, you can chose the skip the other half, which we did, making our hike just under 3 miles today. Another beautiful day in this life and on this journey. Only five days to go!!! 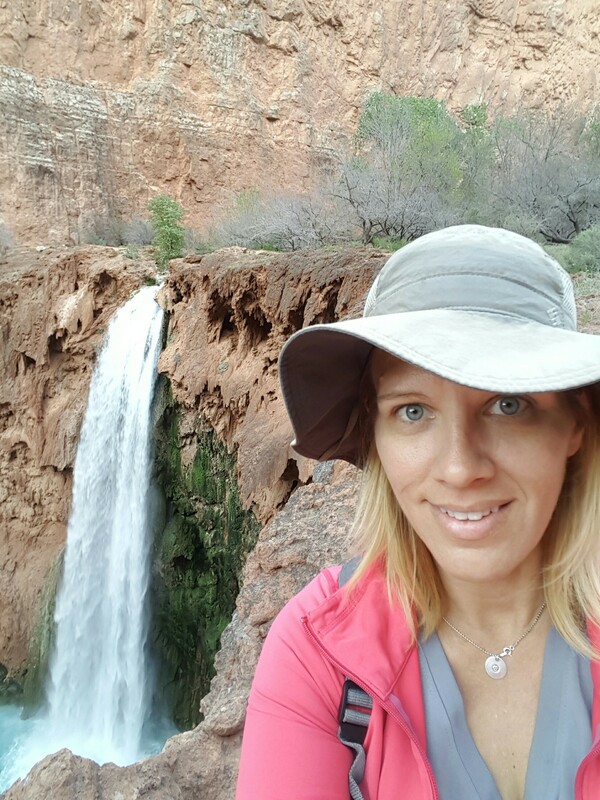 I was given the opportunity to hike Havasupai Falls from my friend Susan. 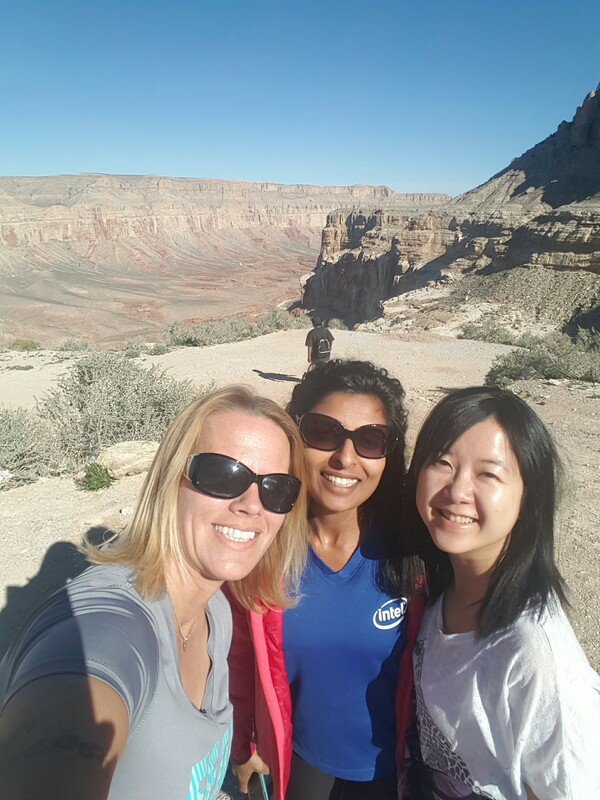 I had met Susan last May when we hiked Rim to Rim in the Grand Canyon. 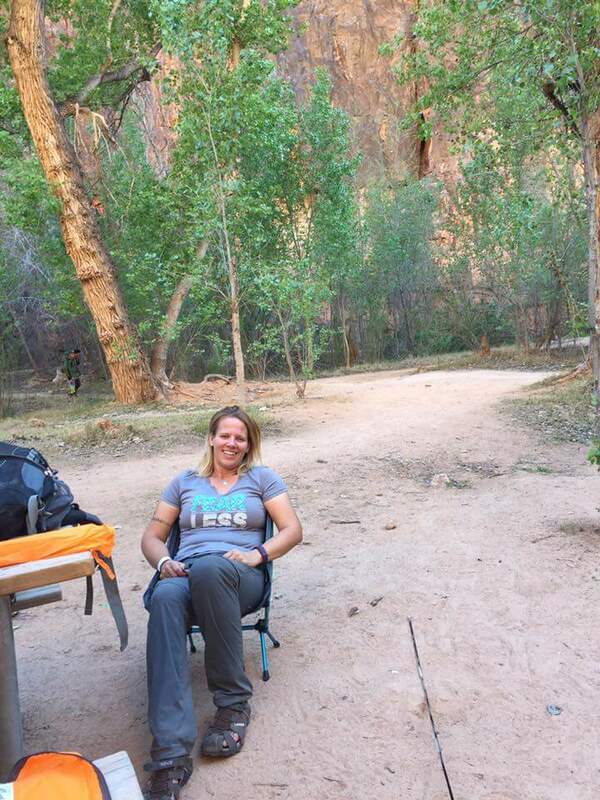 To get a permit for Havasupai is very difficult. You spend hours on the phone trying to get through, just to make the reservation. I didn’t bother to even try this year. They did change things up this year to allow for online reservations, but that didn’t work too well, as the system crashed. Anyway, Susan’s husband couldn’t go, so she asked me if I wanted to go and I jumped at the offer!!! 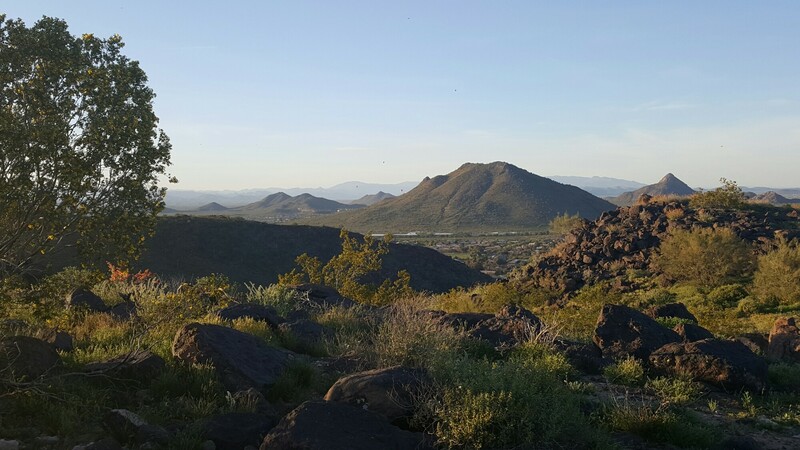 We left Phoenix around 4:30 am to drive the four hour trek to Hualapai Hilltop, where we would begin our hike. The trailhead lays just 60 miles north of Route 66 on Indian Road 18. Beautiful scenery on the ride up there, but the road never seems to end. We finally arrived at the trailhead as early as we could get there and we began our hike just before 10 am. I was afraid it was going to be hot down there in the canyon. Especially while wearing my 23.5 pound pack. I tried pruning the weight of my pack as much as possible, bringing only the necessities, although I did buy a one and a half pound chair for this hike. Not a necessity, but something I’m sure to enjoy. The three of us starting our adventure of a lifetime! 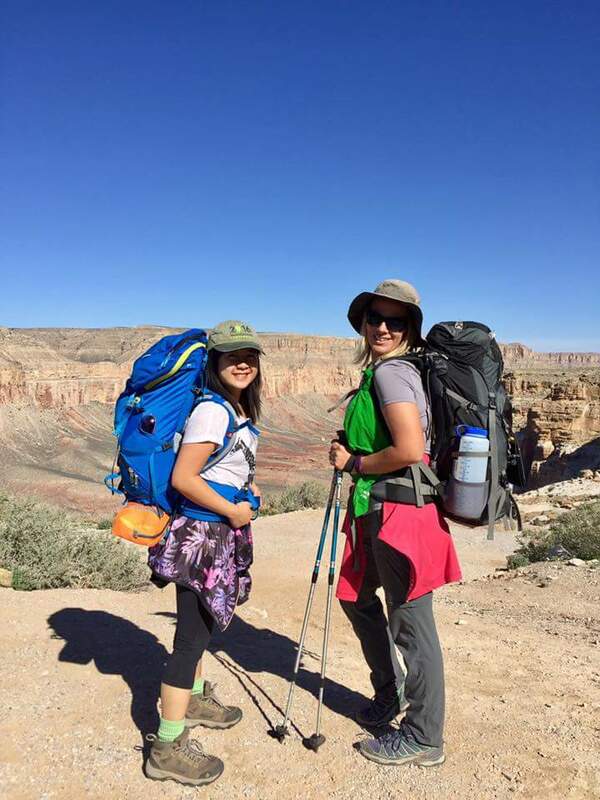 This being my third time in Havasupai, Susan and KT, are experiencing their first visit. 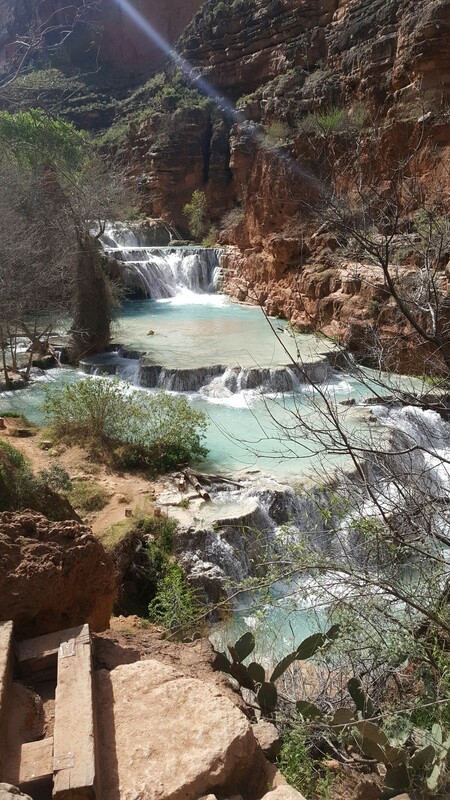 My first visit to Havasupai Falls was three and a half years ago. 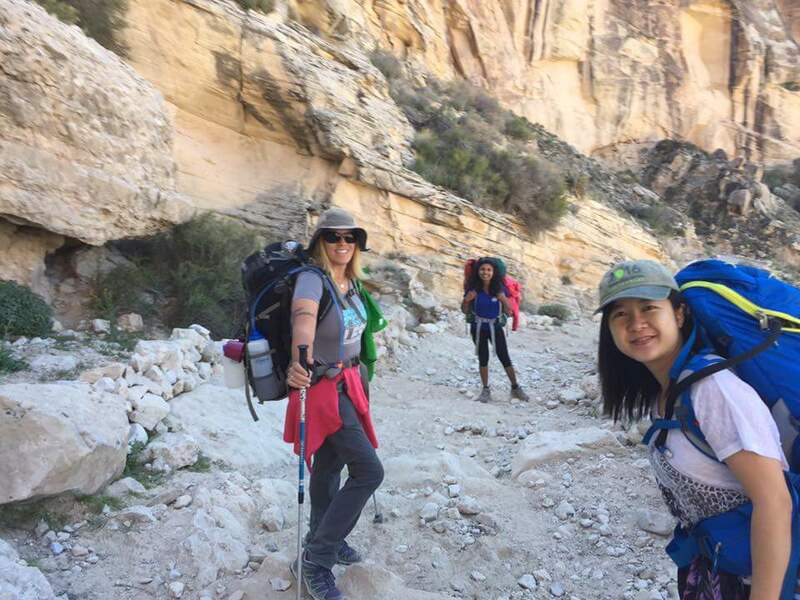 My love of hiking began while training to do this hike. 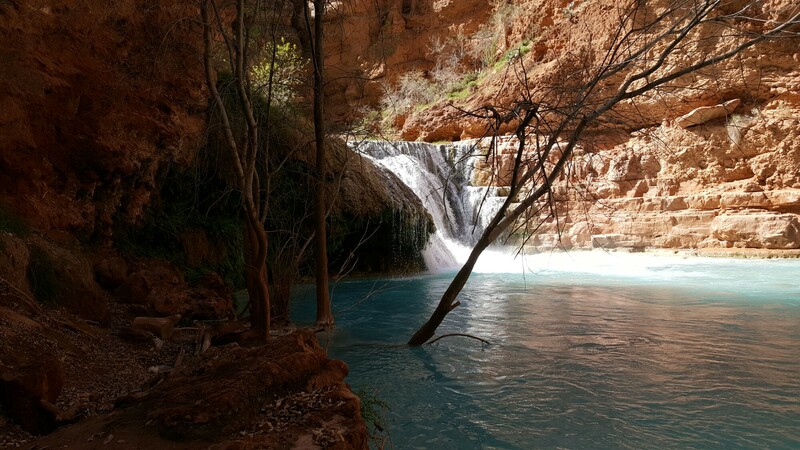 Having recently been divorced, a friend of mine suggested we hike Havasupai. I agreed, what an amazing trip this would be! So once the phone lines opened in February, she got in and we had our reservations for my birthday weekend, September 2013. 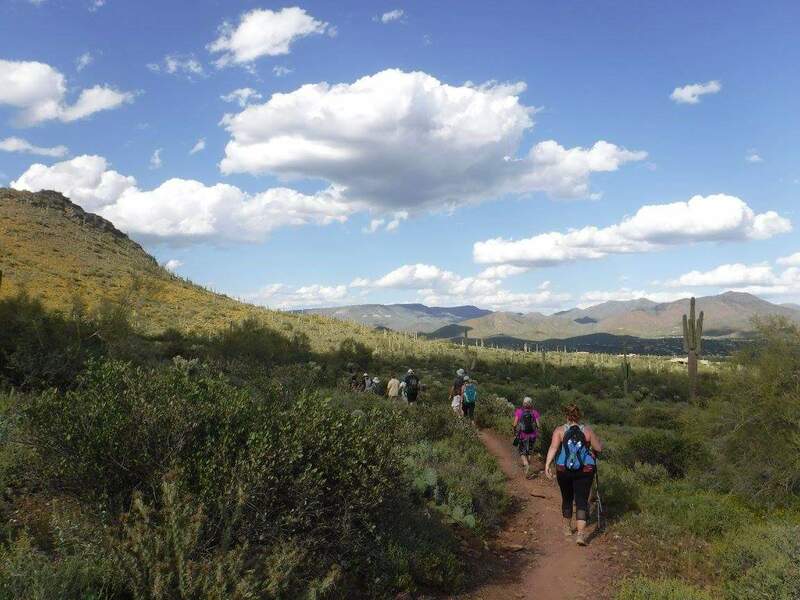 In March of that same year, we began our training on our first trail, the Go John Trail at the Cave Creek Regional Park. 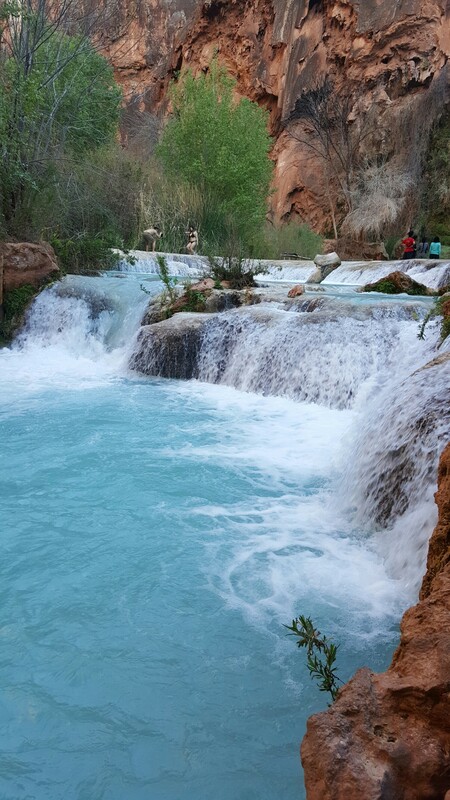 We made it down to Havasupai with ten other friends and had the most amazing time! Climbing out of the canyon on my 36th birthday, I arrived at the hilltop at 9:23 am on 9/23/2013. It couldn’t have been a more promising God shot! To now come full circle from where it all began, is such an amazing opportunity. This is my first backpacking adventure on this journey and I am so grateful to have it be here, where my love of hiking began. 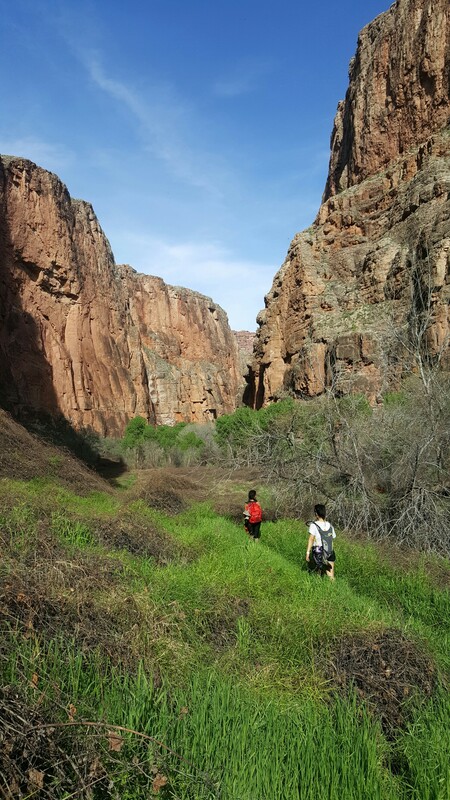 Beautiful views surrounding us as we began our 2000 foot climb down into the canyon. Following the switchbacks down, it was an easy trek. The only trouble I had was with the weight on my back. I was constantly adjusting my pack. All smiles! 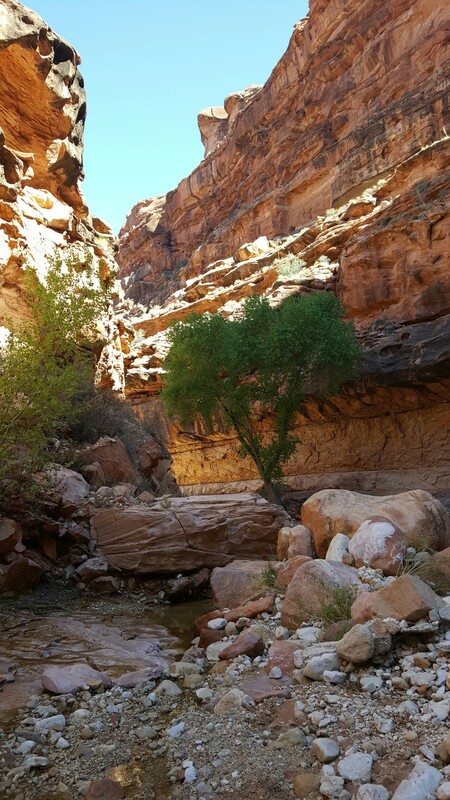 The canyon is an amazing place. The beauty of this place can make anyone smile. As you hike along the trail, which is for the most part a dry riverbed, the rock walls give off shade. Depending on the temperature, they also give off the heat, but we were lucky. Going down, the heat didn’t feel too bad. After about five miles we came upon our first sight of water. Little springs coming out of the ground. A tree standing tall in the center, so green and alive! The colors of the canyon walls mesmerizing! Such a beautiful place to be. Almost to the village! We’ve already hiked seven miles at least. From this point until we reached the village, we would be under the cover of trees. We soon caught glimpse of the turquoise river. Our first view had us spellbound by the true beauty of this amazing place. Paradise in the desert! 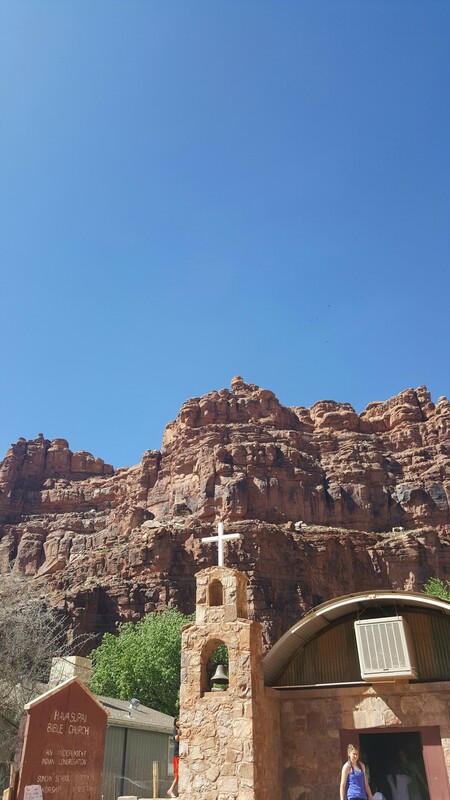 We made it the 8 miles to the Supai Village in less than 3 hours. Much faster than I had anticipated. We checked in and got our wrist bands. Stopped at the grocery store, where I bought the most expensive orange ever, but it tasted so good! It was worth it! 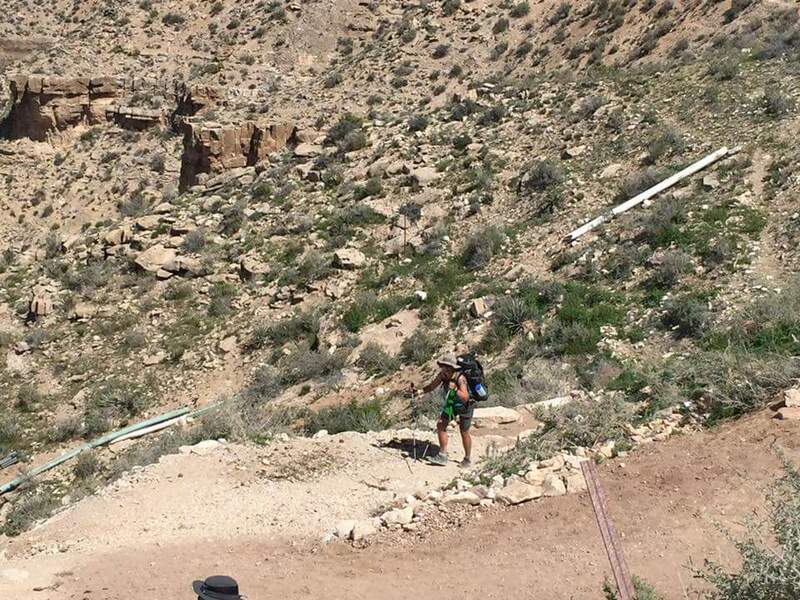 Then we headed to the restaurant where the girls ordered lunch, I decided to not buy anything, I had my Mountain House and I wasn’t willing to carry it back up the canyon. I would wait to eat. My orange was enough for now. After lunch, we made our way to camp, hiking through the village we came upon the church. Taking a picture of the cross, for my mom, who loved crosses. I had intended to make her a book of all the crosses I had seen on my adventures, the idea stemming from this cross, but I never did. Now I never will never get the chance to make her that book. Seeing this cross reminded me that I chose to come here, not only to be on an amazing adventure, but to be here in this beautiful place to try to begin to heal. Although I may never get the opportunity to give my mom this special give, I can still complete it for her, in her memory. After sitting in the restaurant’s air conditioning, our hike to camp became much warmer. We only had to hike two miles until we would reach camp. Along the way we came upon our first glimpse of Navajo Falls. 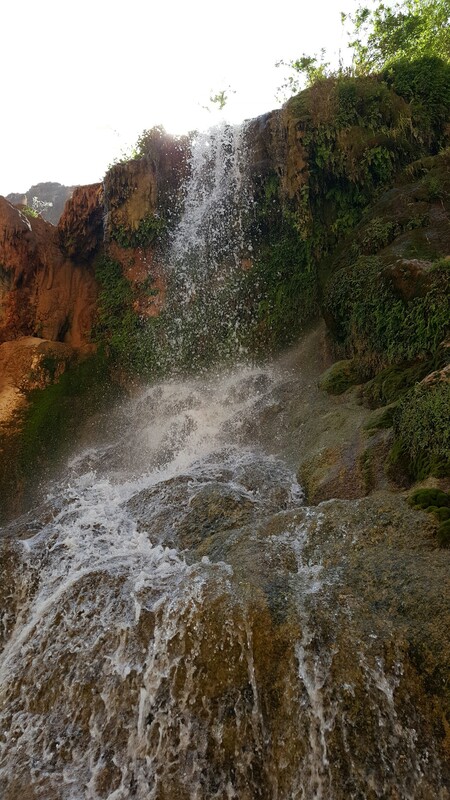 The beautiful waterfalls took your breath away! People were out enjoying the water. I so badly wanted to soak my feet in the cool water, but we decided to continue on to camp. 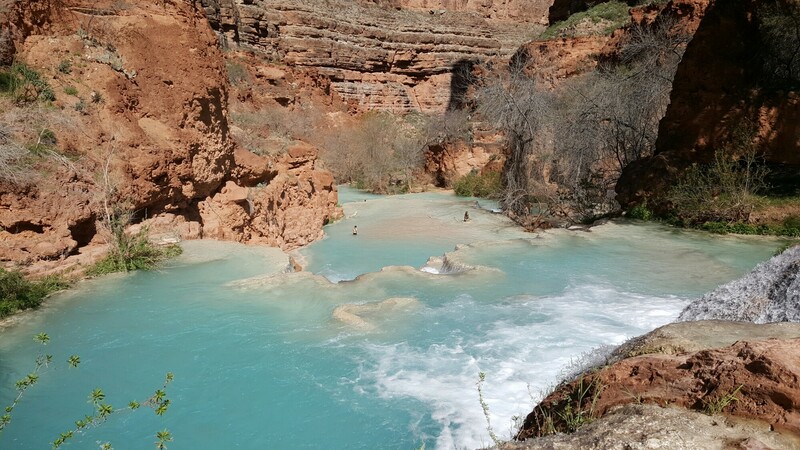 Less than a mile later we came upon Havasu Falls! The most stunning waterfall ever! 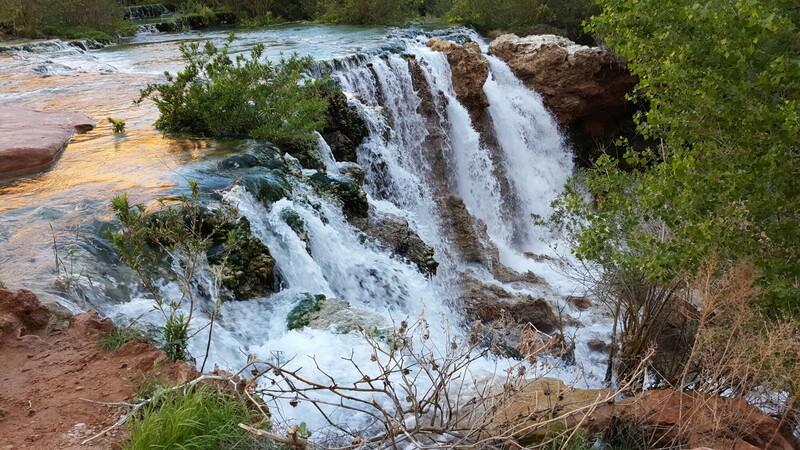 A 90 to 100 foot waterfall plunging into a turquoise blue pool of water. Mesmerized we stood on the hillside staring at it beauty. 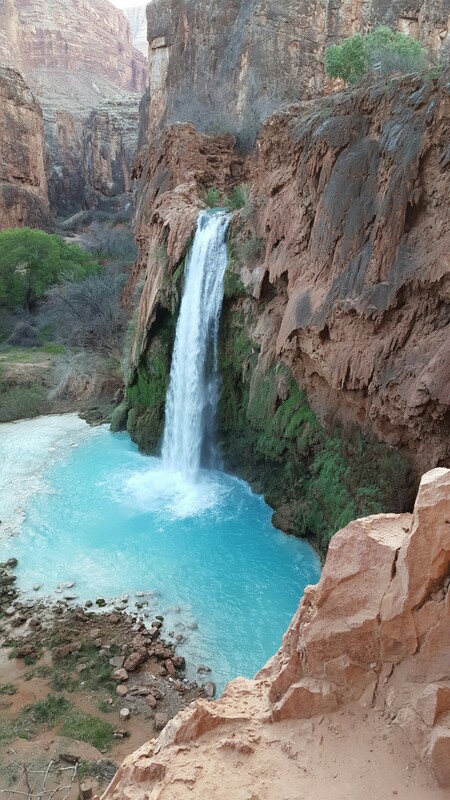 From Havasu Falls we headed over to camp to unload our packs and put up our tents. KT, with her bright orange tent, you couldn’t miss us. We set up close to the camp entrance, close to the bathrooms and close to the water. We were in the shade most of the time and it felt like the perfect spot. 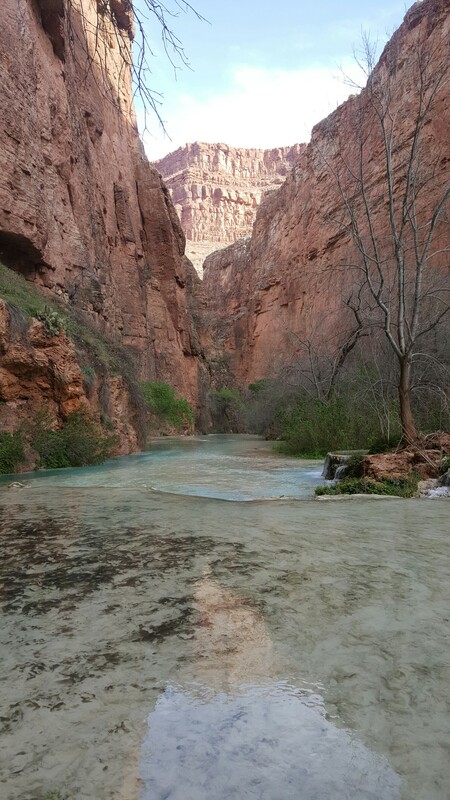 From camp we headed back over to Havasu Falls, our plan was to get in and enjoy the water. A short half mile hike, at first we needed to hike back up the hill. 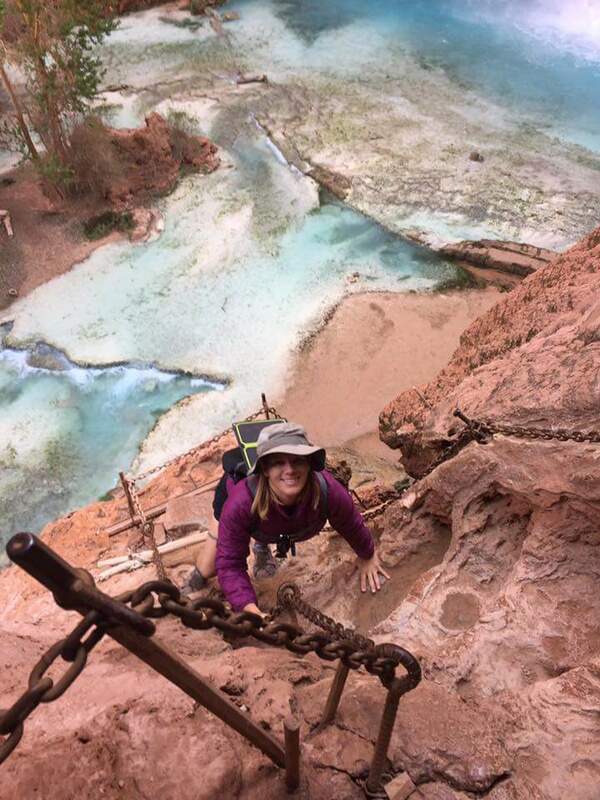 Then we climbed down the rocks, through a trail, that will lead you to the base of Havasu Falls. The mist from the waterfall came at me unexpectedly cold. It made the air much cooler as we were also in the shade. Walking across the water to get as close as I could to the falls, the water was much colder than I expected too. I walked through the water everywhere I could without getting soaking wet. I was having fun exploring and taking pictures. Trying to take it all in. The force of the waterfall coming over the cliff, the mist on my face, the cold turquoise water on my feet, the sounds of the rushing water. It was all so overwhelmingly beautiful! 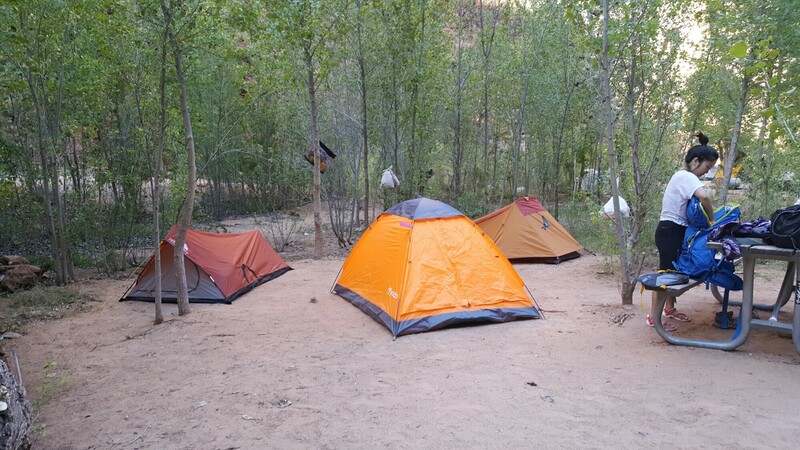 Once we had our fill of Havasu Falls, we decided to head back to camp and have some dinner, then head over to Mooney Falls and check it out. 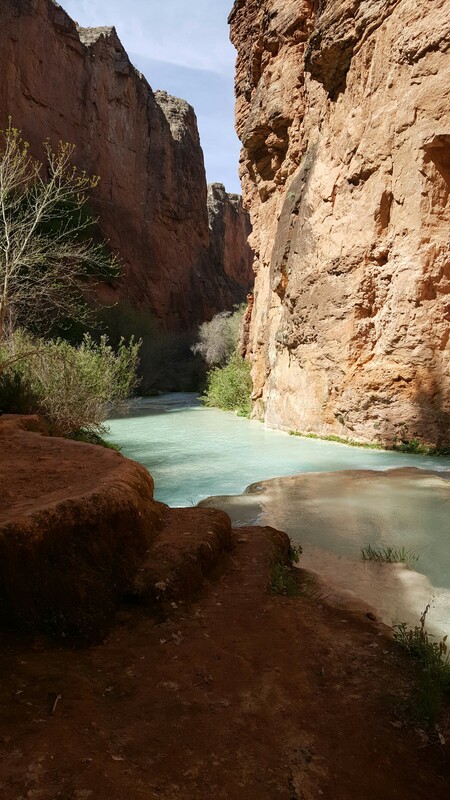 The river traveled through the camp and we followed it along as we headed to Mooney Falls. The river was a beauty in itself. The color of course, but sections would break off and there would be miniature waterfalls. 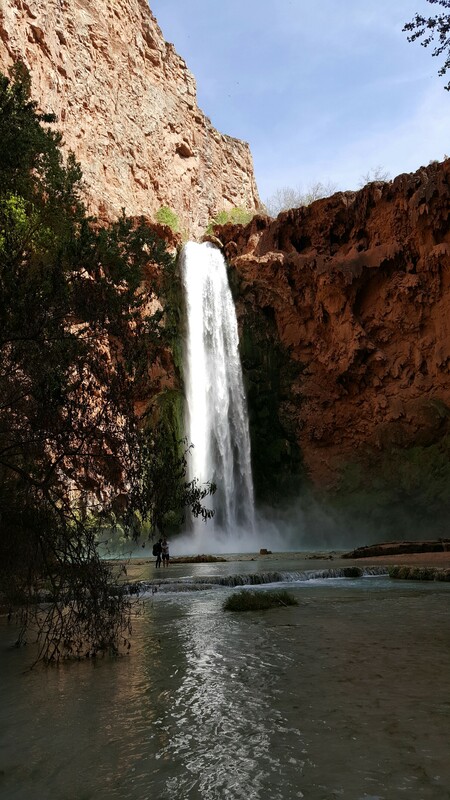 We made it the short distance to Mooney Falls, a 200 foot waterfall with another spectacular pool of the blue-green water awaiting at the bottom. All of us were exhausted, we tried to stay awake, but I think none of us made past seven. Listing to the majestic sound of the river flowing, I fell asleep. With only one week away from completing my journey, today I get to see the amazingly beautiful Beaver Falls! 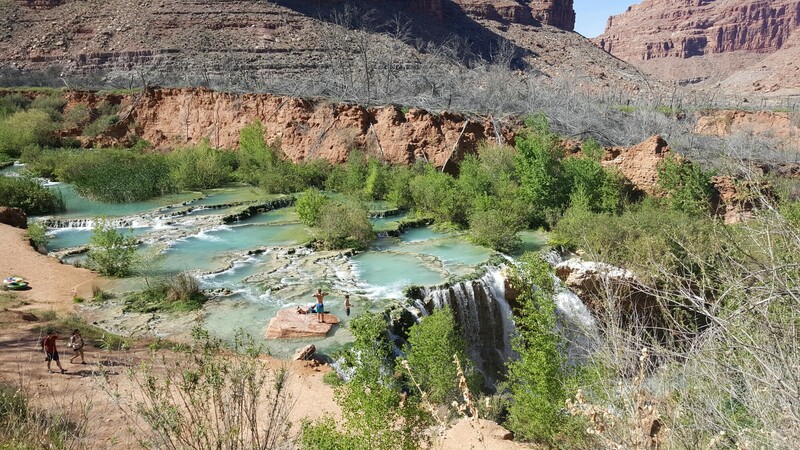 One of which I’ve only seen once before on my first trip to Havasupai Falls three and a half years ago. I am so grateful to be going here once again. Heading out early, we had a visitor accompanying us on the trail. He followed us most of the way to Mooney Falls before he found another group to hang out with. From our camp, Beaver Falls is roughly four and a half miles. 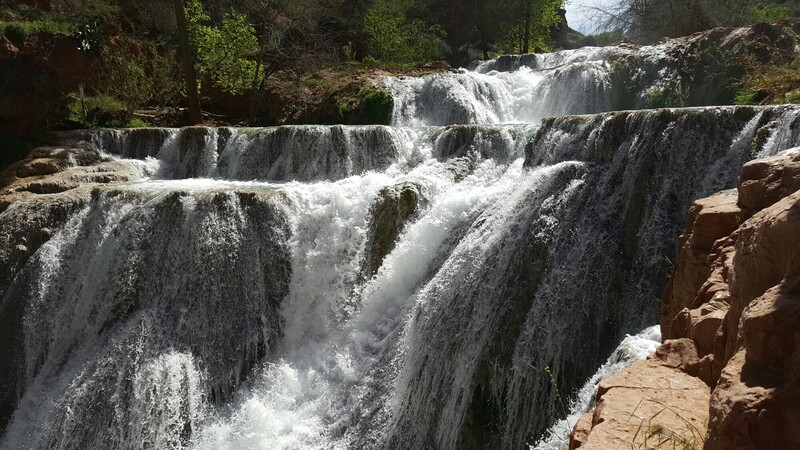 To get to Beaver Falls you must first climb down the rock wall of Mooney Falls. Having only seen it from the top yesterday, I’m not sure if the girls knew what to expect. After hiking down the trail to get to Mooney Falls, and facing the steep cliff-side descent with lots of drop-off exposure as you descend, you come to the first tunnel. There is a sign just before the tunnel “descend at your own risk”. A fair warning for what I was about to encounter. Getting ready to head through the first tunnel to Mooney Falls, at first I thought I’d need my headlamp, which I remembered I’d left in my tent, but then I realized I could see light at the end of the tunnel. So, I navigated my way through allowing my eyes to adjust to the darkness. 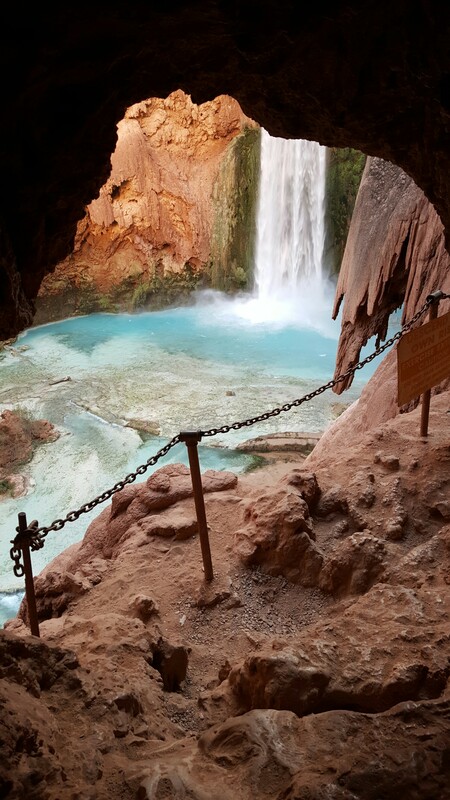 On the other side of the second tunnel, you catch a glimpse of Mooney Falls from another angle. The way the rock encompasses and frames the water, just the contrast of colors, is so perfect! From this point on, the chains begin. Grasping on to the old wet rusted chains that are affixed to the rock walls of the cliff, I began my descent. Climbing down the slippery footholds that have been carved out of the rocks, while holding on to the chains, making sure I had three points of contact at all times. By climbing down backwards, I wasn’t looking out over the edge at the sheer cliff that could be at least 50-100 feet high. Eventually I came to the wooden ladders, covered in moisture from spray from the Falls, they leaned haphazardly against the rock wall. The ladder worn from so many uses, created divots on each rung from the hands and feet of those who have come before me. Realizing the ladders were anchored to the wall diminished the little bit of fear I encountered. Heading down the ladder backwards, I quickly made my way down to the safety of solid ground. Susan followed just after I did. KT on the other hand, frozen on the rock cliff, thought she would wait for us, not realizing that this was the only way to make it to Beaver Falls our destination for the day. Worried about the slippery rock and not having the proper shoes, I decided to take Susan’s shoes up to her. Once she changed shoes, we made our way slowly down the rock face and began the most beautiful journey! From the beginning, the beauty of the canyon walls had me in awe! The river continued on through the canyon with it’s amazing views. Crossing the river to find a trail, we had to come back to actually get to the trail. Two things I realized…. One – I have only been here once before, so I vaguely remember where I am going, and two – there is much more water than there was the last time, and parts of where I think I had gone were now covered by the beautiful water. One good thing is, that you can hardly get lost, as there are walls on either side of you to guide your way. We continued on through the trail we had found and soon we were headed through, what I was once told was called the “green mile”. The leaves of the vines were not there this time, but had they been there, the green mile would have been even more green. It was still amazingly beautiful! After three and a half miles from Mooney Falls, we made it to Beaver Falls! A beautiful sight to see! It was even more beautiful than I had remembered, if that is at all possible. So many layers of water casting down it’s ledges. Coming to this spot, I assumed this was the end of the trail. Across the river you could see the rope attached to the rock wall, where you could make your way to the top of Beaver Falls. The water looked deep and I wasn’t prepared to swim across. The girls headed back to the other side, while I stayed in this spot a moment to enjoy the beauty and have a quiet moment of peace. With the sound of the waterfall filling my ears and the gorgeous green ivy surrounding the walls, I said a prayer and the tears began to flow. I began to let go. I was beginning to let go of the pain I felt from losing my mom. To know a piece of me was left here, I feel the tragic loss of losing her may eventually be okay. Once I decided to head back over to the girls, I realized that I didn’t have to swim to get across the river. KT was already in the water knee deep. I walked through the water to the wall and made my way up. Clinging to the wall, I grasped on and continued across horizontally. There was one section where I wasn’t sure if I would make it. Debating on moving forward or going back, I decided I would take the chance and move forward. Who know when I would ever be here again. I made it to the ledge I was aiming for without falling into the water. From there, I climbed the rope next to the ledge. I didn’t see the ladder from the other side, but now that I’ve seen it, I climbed my way further up to the top of Beaver Falls. Standing in the center of Beaver Falls looking down below couldn’t have been more majestic. Since that peaceful moment I took for myself on the other side of the river, my heart felt a little lighter and I was feeling nothing but sheer joy! Standing in Beaver Falls with the water flowing over my feet was pure magic. I walked further up the river to check out more of the amazing beauty. I know there is a way to get back following the river, but with the girls behind me, I didn’t want to leave them, so I made my way back down Beaver Falls. I made it down the ladder and rope without any issues, the rock wall was another story. I managed as best I could to not fall in the water, but that didn’t happen. I fell in. Luckily I had put my phone in the dry sack, for this reason. Once in the water, I pulled myself up on the wall and shimmied across until my feet could touch the ground. Items in my pack were not made to get wet, but luckily it was only my towel that got damp. Excited to have completed my little trek, the girls and I enjoyed the falls a little while longer. After hanging out at Beaver Falls for awhile we decided to head back to camp, finding even more beautiful waterfalls along the way. At some point we had made a wrong turn. We weren’t hiking back the way we had come. Walking through the river I could see Mooney Falls. Since that was where we were headed anyway, I decided to continue on through the river and see where it would take me. 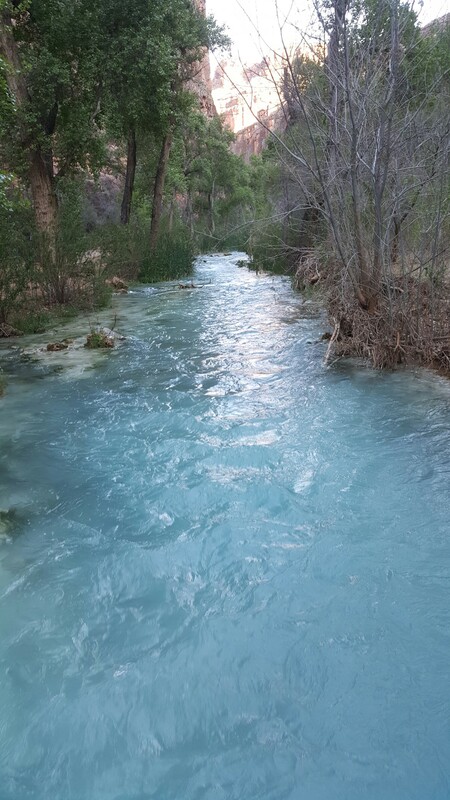 As we continued through the river, we came upon a nice surprise,the water was beautiful! With the sun shining upon it, it made the colors of the water even ore vibrant. Realizing I had seen this on the way in, but then I was high above on the trail. Coming around a bend in the river, to my surprise, there was another waterfall. Maybe thirty feet high, it was amazing! I put my hand in the rushing water to feel its force. Such beauty! We made it safely back to Mooney Falls. Snapping one last picture of the falls, with the sun shining intently on the falls, we climbed up the cliff and headed back to camp. The climb up was even faster than the climb down. Resting in my new chair, I stayed at camp the rest of the evening. I was exhausted after two long days of hiking. I decided next time I would bring a book to read while at camp. This time however, I just enjoyed the beauty that surrounded me. The quiet peaceful moments I rarely get to experience as a single mom with three kids at home and who works two jobs. I relaxed my evening away. It was an early night for the second night. 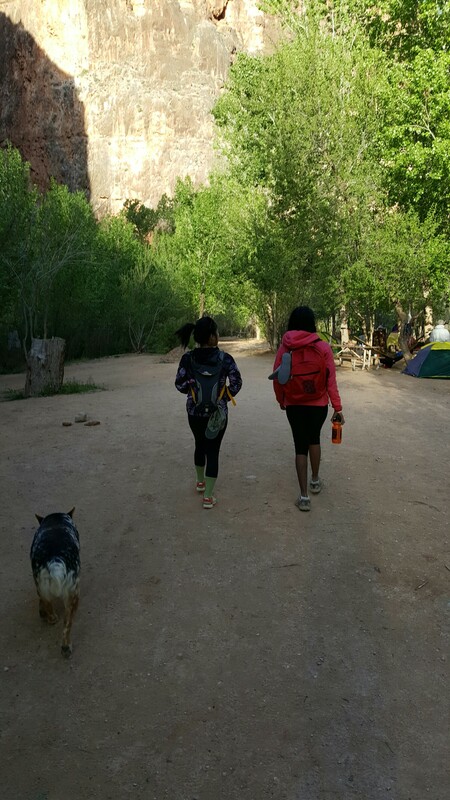 We would be hiking out early in the morning. My camera had 4% battery. 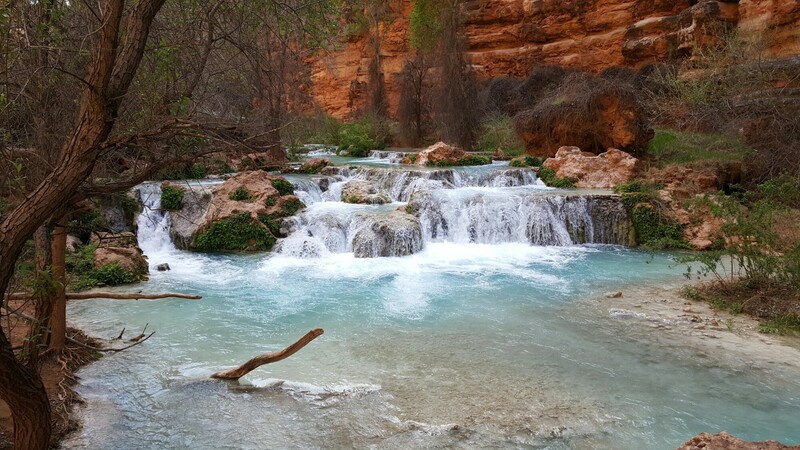 I captured one last photo of Havasu Falls before heading up the hill. My pack felt lighter without all the food I was carrying. 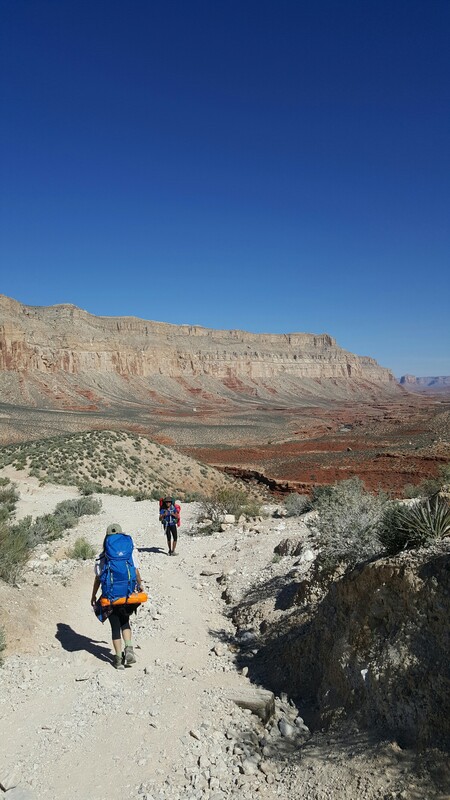 A pet-peeve of mine, “pack it in, pack it out” is a standard for any trip into the wilderness. Yet no one does it! So much garbage from the visitors was laying around. It destroys the beauty of this amazing place. I made sure to pack out all of my trash, why shouldn’t I pick up after myself? I can’t handle the laziness of people sometimes. 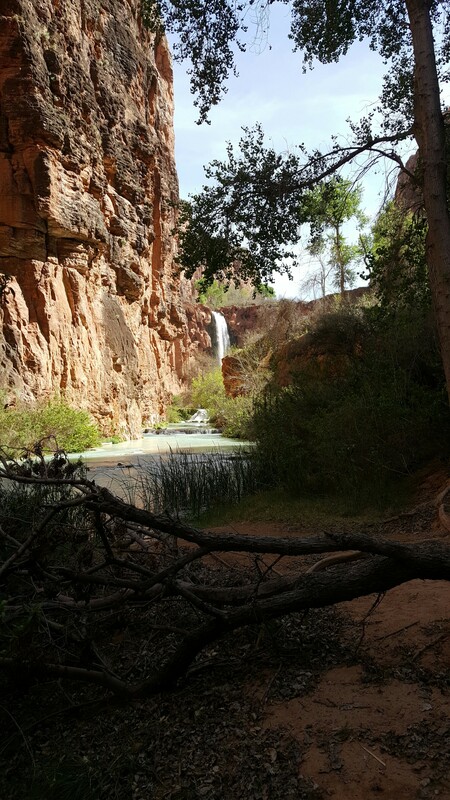 The second photo I was able to capture, one last photo of Navajo Falls. I set my pack down at the top of the hill and hiked down a little ways to capture just a little more of the beauty the Navajo Falls has to offer. Saying good-bye to this place is hard. The hard part is knowing I have about nine more miles to hike today, but then again, it’s only nine miles. I can do that no problem. We made it to the village where we filled up on water and used the rest room, where we could actually wash our hands with soap and water. What an amazing feeling! I left the girls at the village and began my hike. I wanted to get to the switchbacks before the heat came. We had already left 45 minutes later than anticipated. Susan soon passed me and KT and I were going back and forth on the trail passing each other as we took our breaks. It was getting really hot that last mile before I hit the switchbacks. The heat was radiating off the walls of the canyon. I took one last break before heading up the switchbacks. Climbing uphill with full exposure to the sun was exactly what I didn’t want. I was a mile from the top before I found any shade. 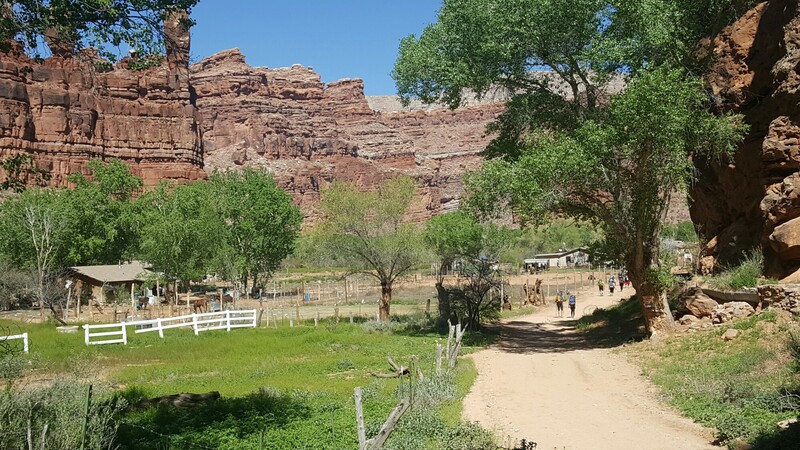 As the mules came down the trail, I would stand on the side of the trail in the shade, enjoying my moment of rest. I made it to the top in 5 hours and 20 minutes. Arriving completely exhausted from the heat. Coming to find out it was only 78 degrees today, but with that sun beating directly on me, it was a hot hard hike. Coming full circle as this journey is coming to an end. We hiked over thirty miles this weekend in one of the worlds most beautiful places. I couldn’t ask for a better gift from God. Join me on my journey of hiking every day for 365 days, to see all that I can see! Never miss out on a post and “like” me on Facebook , check out my videos on YouTube, and for more photos “follow” me on Flick and Instagram! Meeting with my daughter’s girl scout troop tonight, the girls were planning on leading a meeting for a younger troop and taking the kids on a hike. I was all for it! Realizing it would be a small hike, a couple of the siblings of the girls in the troop and Lonnie our leaders husband decided to go on a big hike, so I joined them. The flowers were amazing! 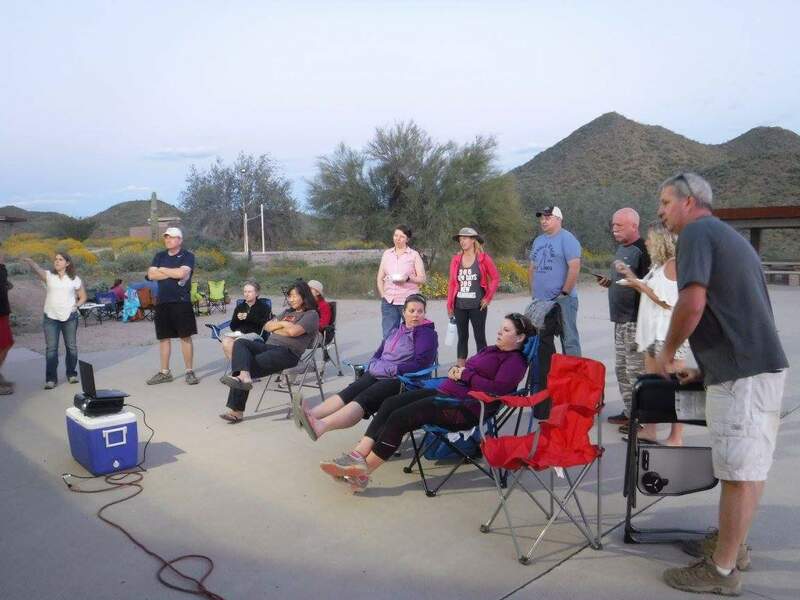 We were on the far north east side of Thunderbird Mountain. It’s been awhile since I’ve been over here for a hike. I was surprised to see so many flowers. Being as this was my second hike of the day, I was a little nervous. I do have a big hike tomorrow and I hoped I wasn’t killing my legs. I pushed on anyway. I’ll survive, I would always much rather be hiking. With the sun shining down upon us, the colors of the desert were so vibrant. The mountains across the valley looked so amazing with all the green. I hope the winters here continue to be as beautiful as they have been this year. We made it to the top. Once at the peak, we wandered around a short while and I noticed another side trail I never new existed. I set out to explore, I wanted to know how far it went. It never ended, or so it seemed. I couldn’t tell with the tall brush how far it would lead. After a quarter mile or so, I decided to turn around and come back to the group. I’ll save the exploring for another day. We had to get back to the girl scout troop. The girls staring off into the city below. I wish my kids liked hiking as much as they do. We caught the sunset as we headed down the side of the mountain. A beautiful evening! Making it back to the trailhead, I was so happy we set out on this hike. My legs felt great! Adding two and a half more miles to my journey of hiking everyday for 365 days! 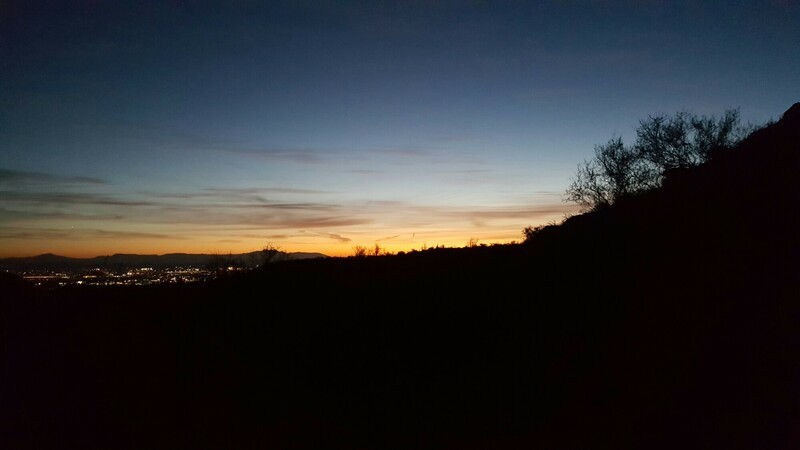 Join me on my journey of hiking everyday for 365 days, to see all that I can see! Never miss out on a post and “like” me on Facebook and for more photos follow me on Instagram! 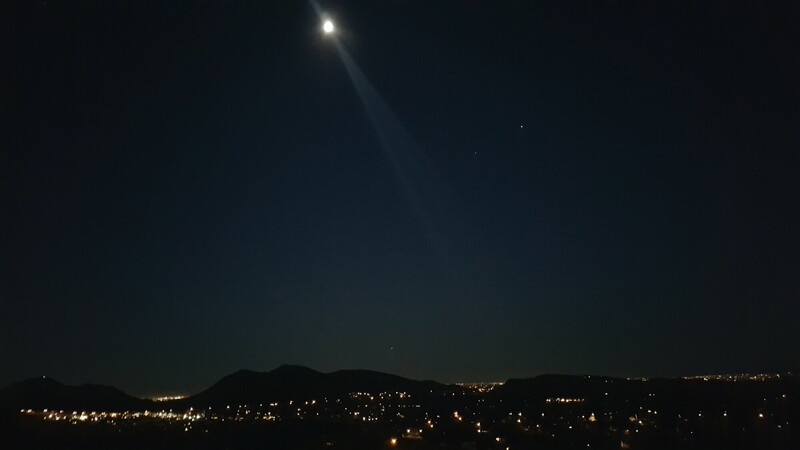 The moon was shining so brightly in the sky. It was so dark out. 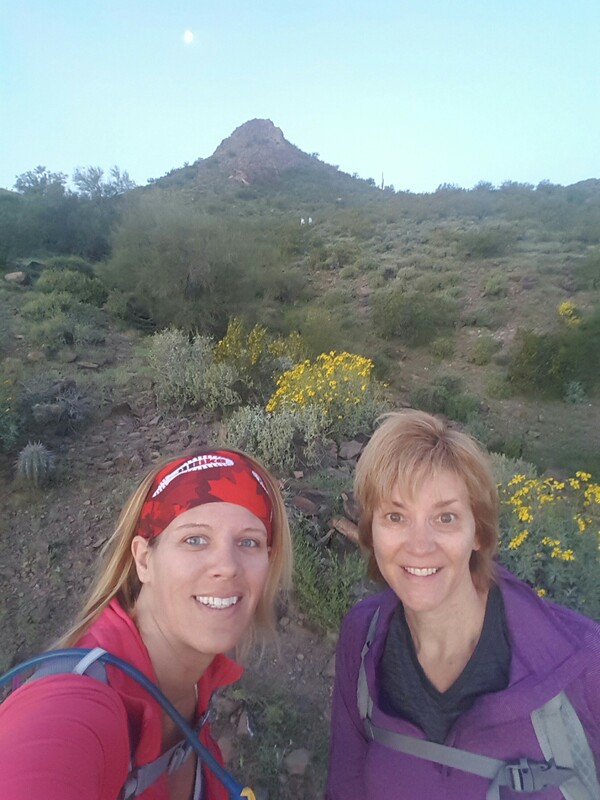 Arriving at 5:45 am, I met my friend Becky at the trailhead on 16th Street just south of Greenway. It feels like I haven’t see her in forever! She won’t be making it to my day 365, so we’re hiking one last time before this journey ends. 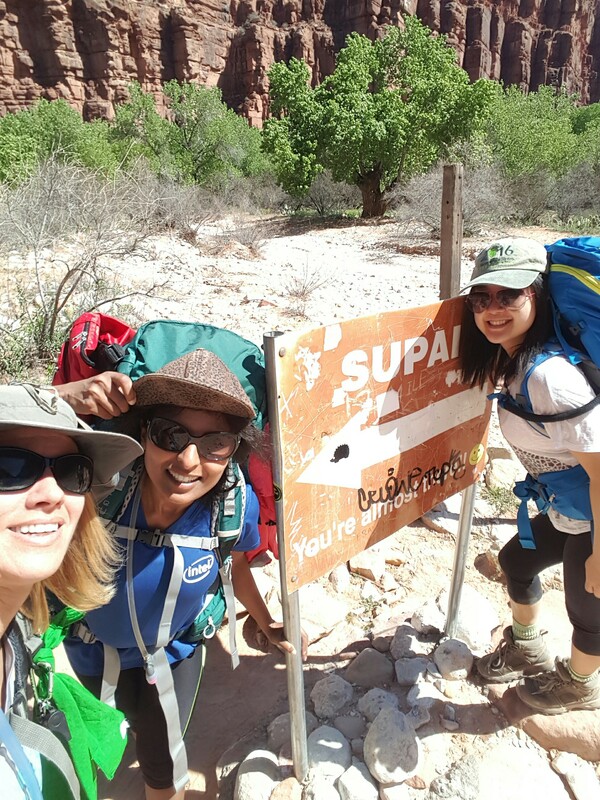 It’s so great to get the opportunity to hike with friends who have been a huge part of this journey. Heading west, The moon just as bright with the city lights shining across the valley. Our plan was to do the Circumference Trail at Lookout Mountain. I have a big hike tomorrow, and I didn’t want to exhaust myself by climbing up Lookout. As we began heading east again, the colors of the horizon started to come alive. The beginning of the sunrise. My hiking buddy, I’ve missed her! Becky was one of the ladies who would be there for every one of Rene’s early morning Trail Mix Hiking Meetups last summer. That was where I met both of them. If no one else showed up, it would be us three. Two beautiful souls! I am so grateful God has put them in my life and on this journey with me. 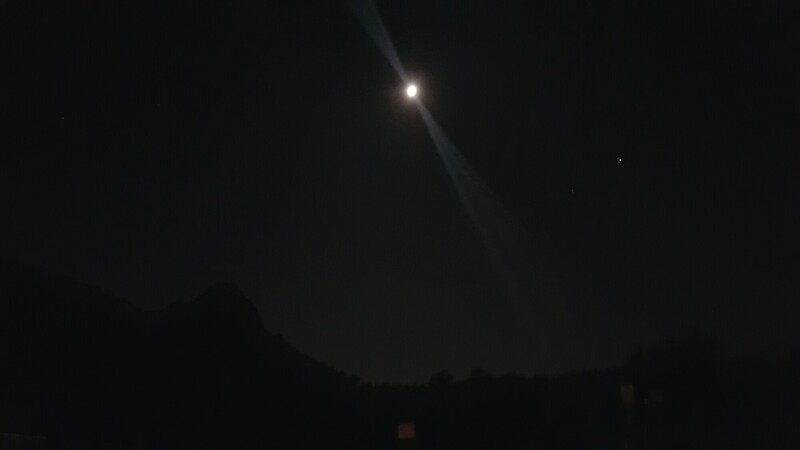 One last photo of Lookout Mountain with the green hillside and the moon hanging in the sky. We hiked almost the miles around the base of Lookout Mountain. It was a beautiful day for a hike and a wonderful hike with my friend! Only nine days to go! 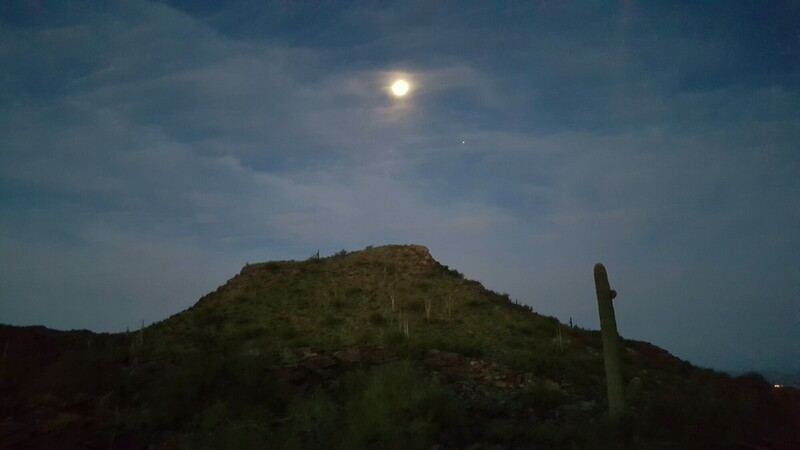 Heading out early in the morning, I drove forty minutes away to South Mountain. I met my friend Jamie from Colorado for a hike. I love that we have the same passion and when either of us are visiting the other, we go hiking! 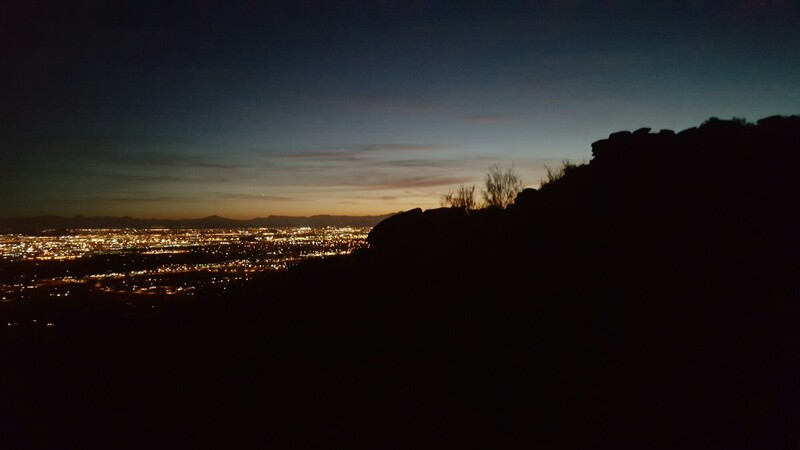 Our hike began on the Mormon Trail, using only my phone as a flashlight, we made our way up the trail in the dark. Starting our hike at 5:30, the sun was already beginning to shine off to the east, yet it was still dark as we hiked. 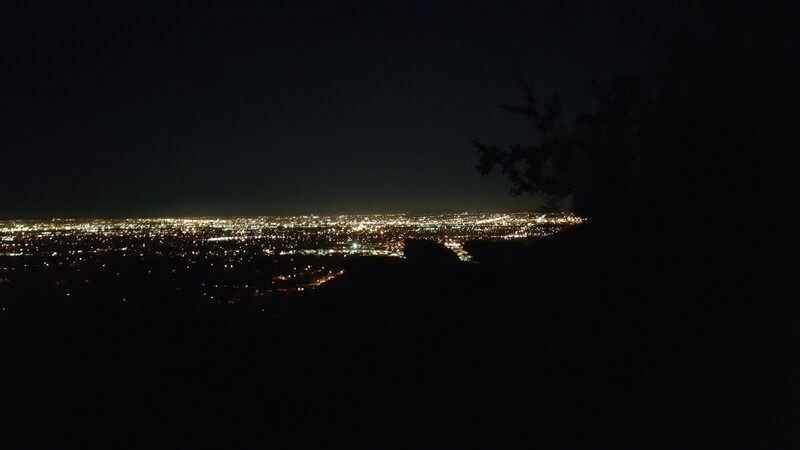 The mountains, the clouds and the city lights all the makings for a perfect view! The sun beginning to rise even brighter as we continued on. It was a beautiful morning for a sunrise hike. The moon, almost full, shining brightly in the early morning sky. I don’t think I’ve ever seen the moon so bright, it was almost bright enough for us to see the trail, but I continued to use the light. A beautiful piece of the desert. 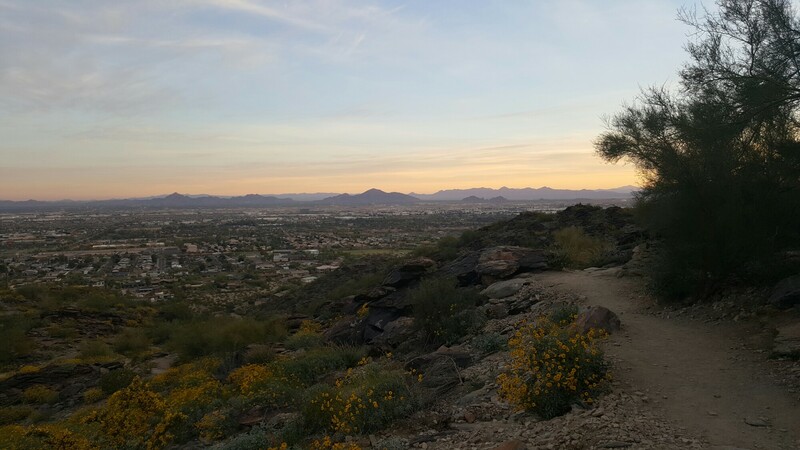 I love South Mountain, it’s just so far away from me. I’m not able to get here on a regular basis. I’m glad Jamie suggested it this morning. Love this girl! It’s amazing how you can meet such a kind spirit on the trail one day and become fast friends. 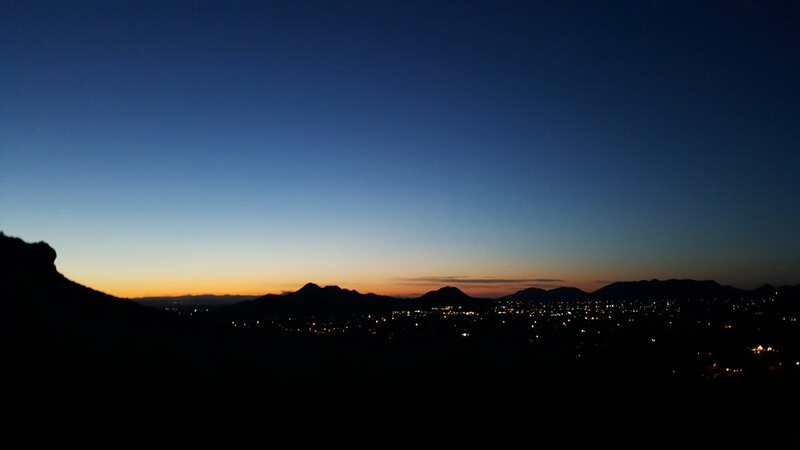 The beautiful colors of an Arizona sunrise. It feels like forever since I’ve seen one so amazing. The richness of color is gorgeous. Jamie and I made it to the end of a ridge before deciding to head back the way we had come. Time was running out for me. I had to get to work. 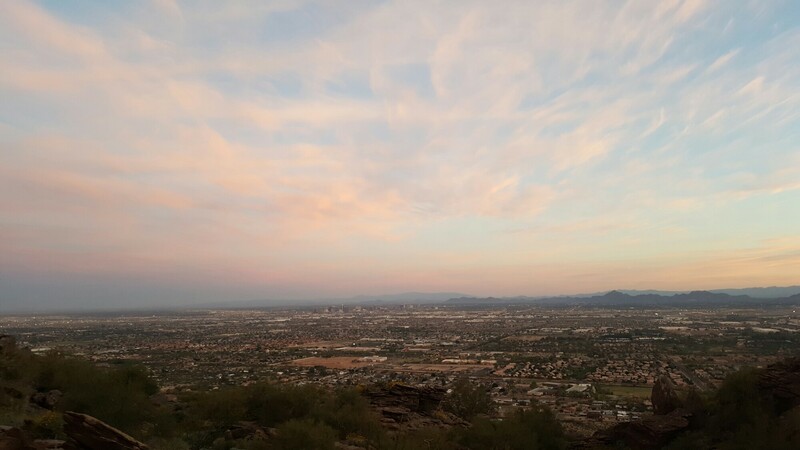 Heading back to the trailhead we were able to witness sweeping views of the city and beyond, along with pink cotton candy clouds in the sky. I don’t think I could ever get enough of this place. With 16000 acres, it’ll be awhile before I could cover all the trails. 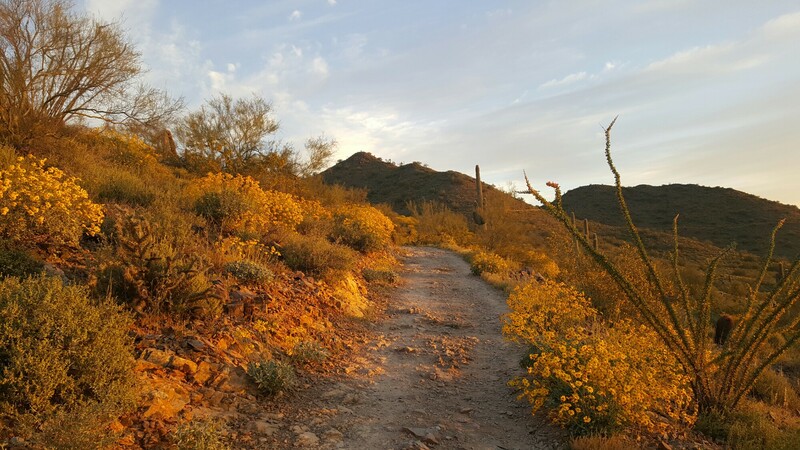 Just before we made it back to the trailhead, we caught a glimpse of more beautiful views, with the yellow-orange colors of the sky. 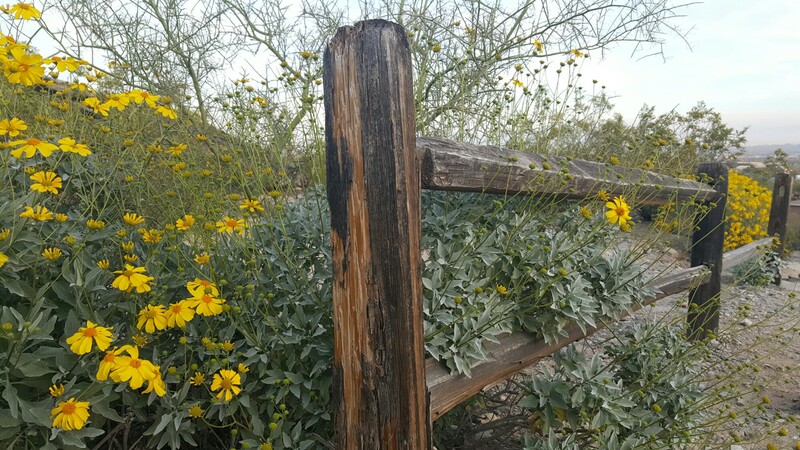 At the trailhead there was this fence. Fences, I don’t know why, but I love them. The contrast in colors comes alive in my eyes. The older and more rustic they look, the more beautiful they are to me! 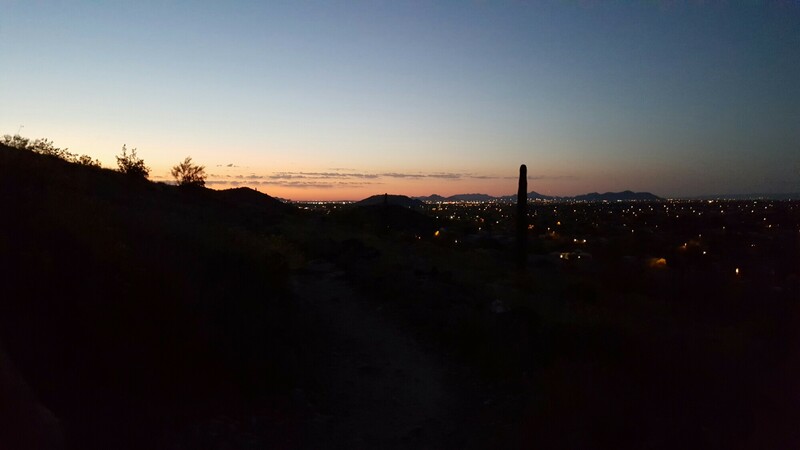 Jamie and I hiked almost three miles on our early morning sunrise hike on the beautiful South Mountain. It was great to see my friend and I look forward to many more of our adventures together!